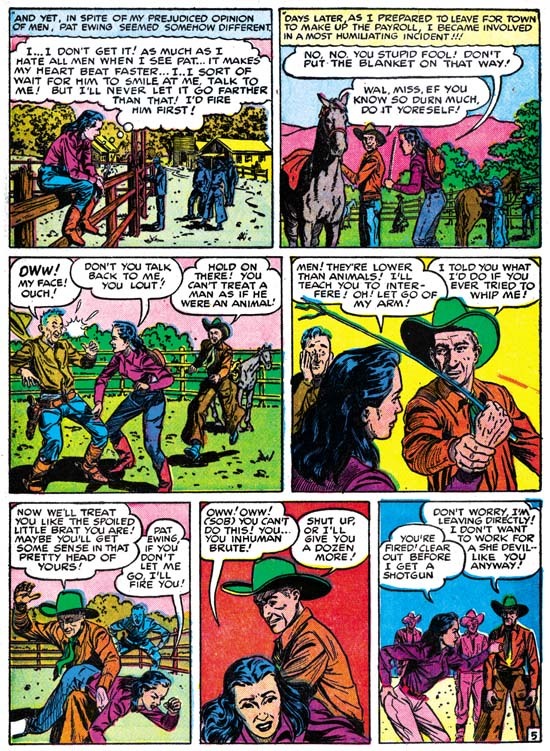 Despite the fact that today many fans point to Boys’ Ranch as one of Simon and Kirby best efforts it was at the time a commercial failure. The last issue of Boys’ Ranch would have an August cover date. 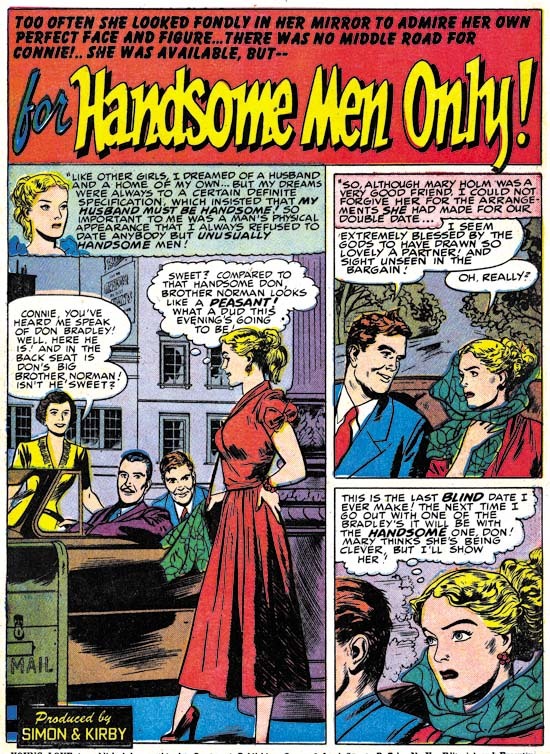 After that Joe and Jack would only be working on the two monthly romance titles and the bimonthly Black Magic all of them for Prize Comics. 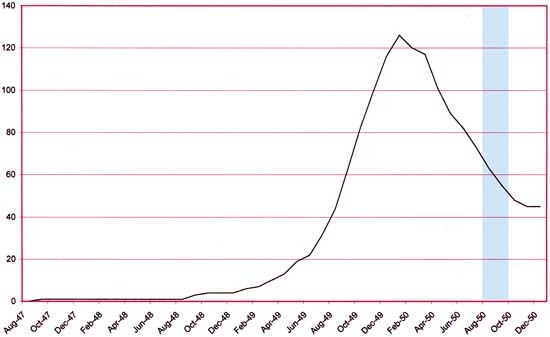 Young Romance entered its fourth year and I believe both romance titles were still selling very well. 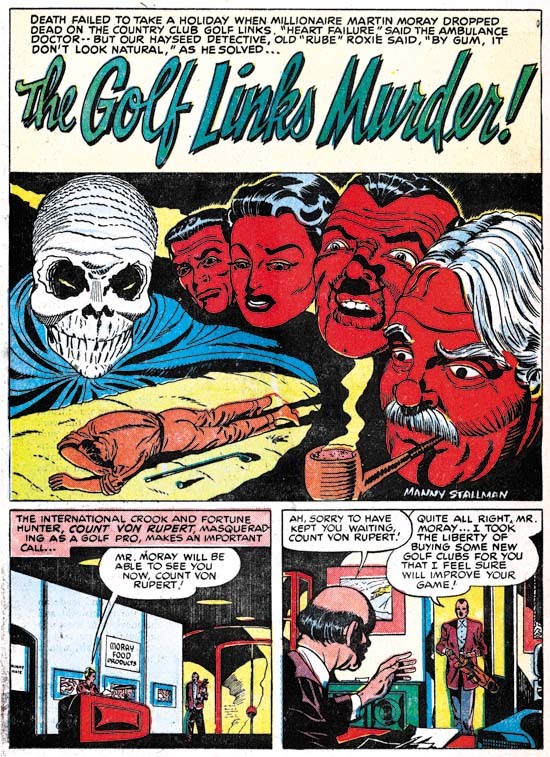 Jack Kirby is legendary for the amount of work he could produce. 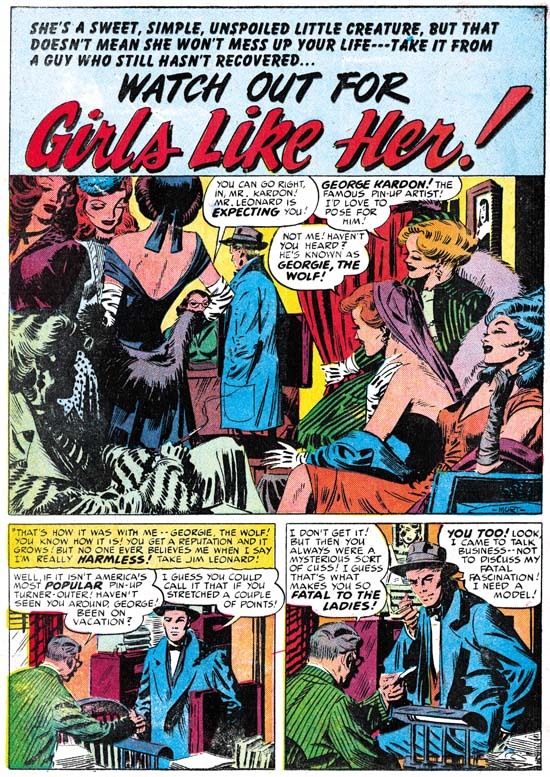 While there were periods during the Simon and Kirby collaboration that support that legend there are other times that do not. 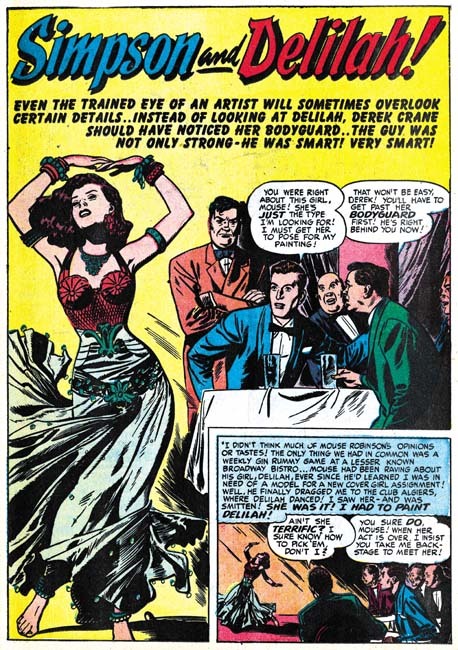 In the previous chapter Meskin replaced Kirby as the most productive studio artist. 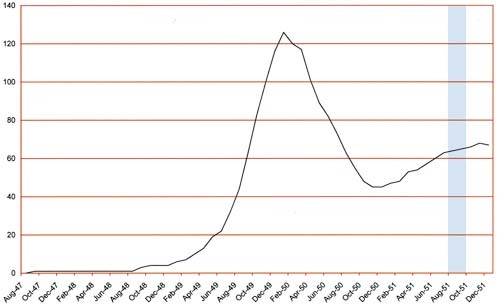 During the period covered in this chapter Meskin has maintained the first place position but now Bill Draut has replaced Jack for the second place. 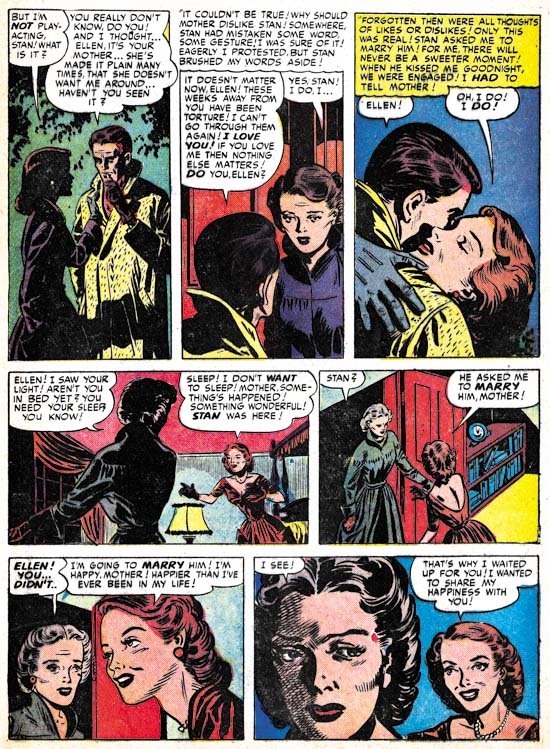 For the romance titles Meskin produced 64, Draut 49, and Kirby 45 pages. 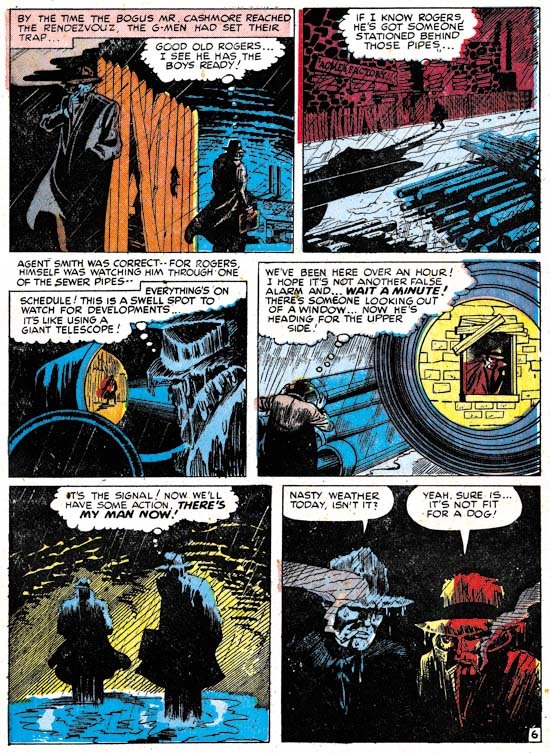 Adding the work for Black Magic only increases the disparity (Meskin 78, Draut 67 and Kirby 60 pages). 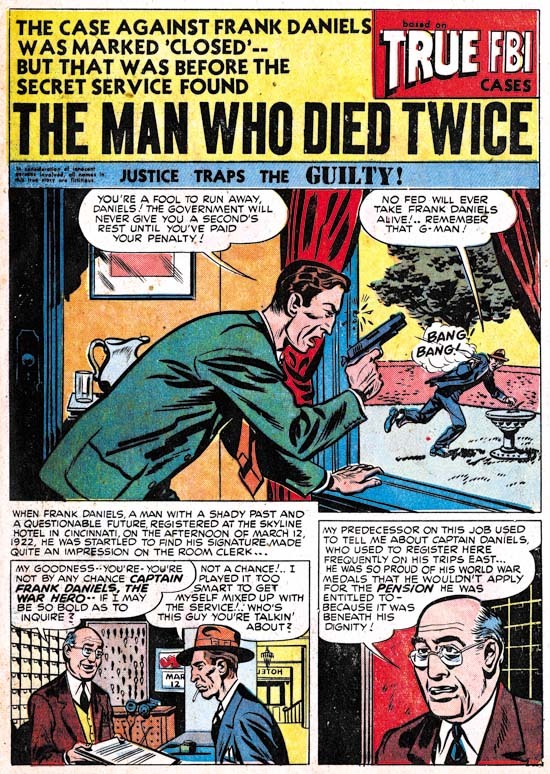 Mort Meskin was famous for his productivity but Bill Draut was not. 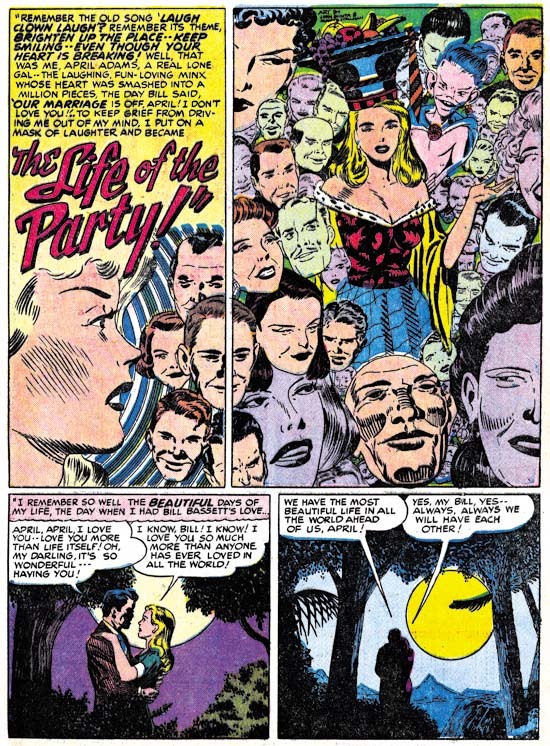 The difference is all the more striking when it is considered that Meskin and Draut were doing all there own inking while Kirby was not. 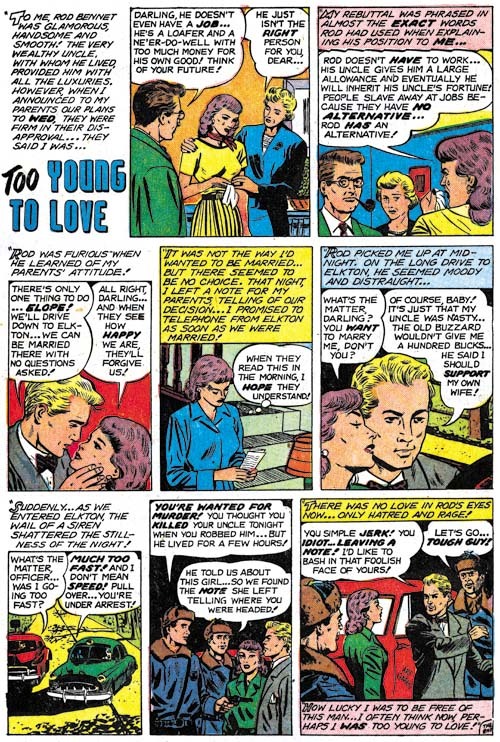 Another indication of Jack’s decreased involvement in the art from this period is that Bill Draut did the lead story for Young Romance #36. 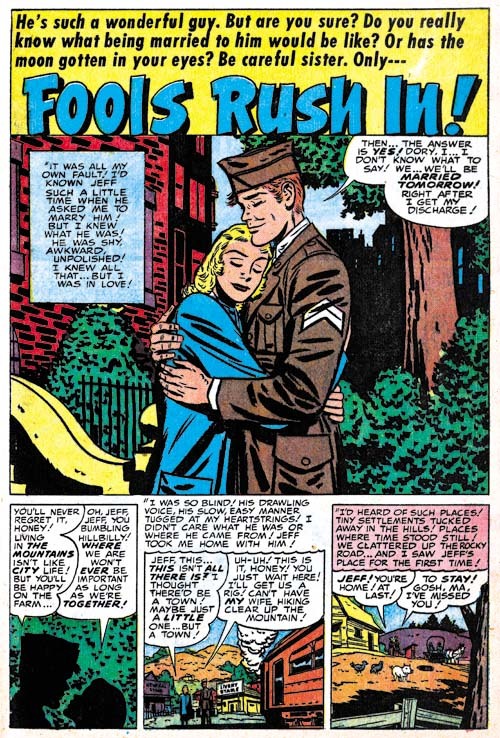 While it was not unusual for the first story of Young Love to be done by artists other then Kirby, Young Romance was the flagship title and up to now Jack almost always provided the lead story. 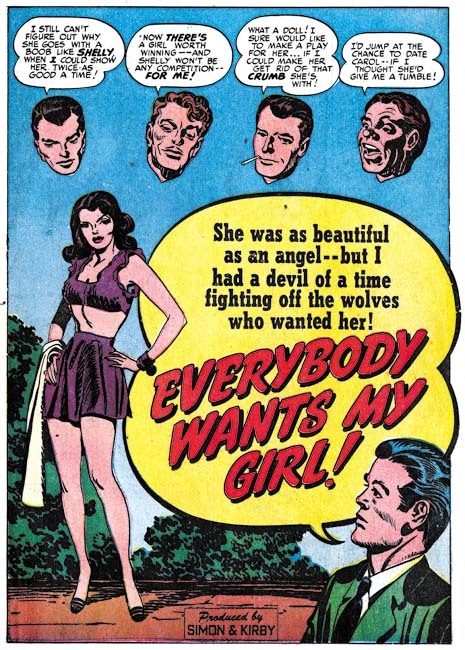 The single previous exception was for YR #12 (July 1949) and Draut was the feature artist on that occasion as well. 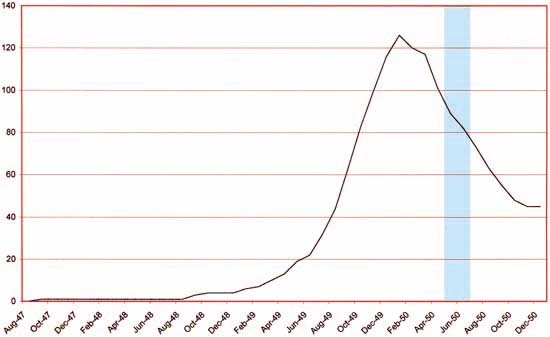 I cannot offer any explanation for Kirby’s decreased page production. 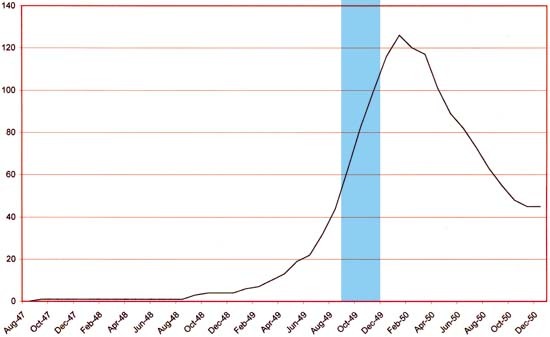 If his time was occupied with trying to develop something new it did not come to fruition. 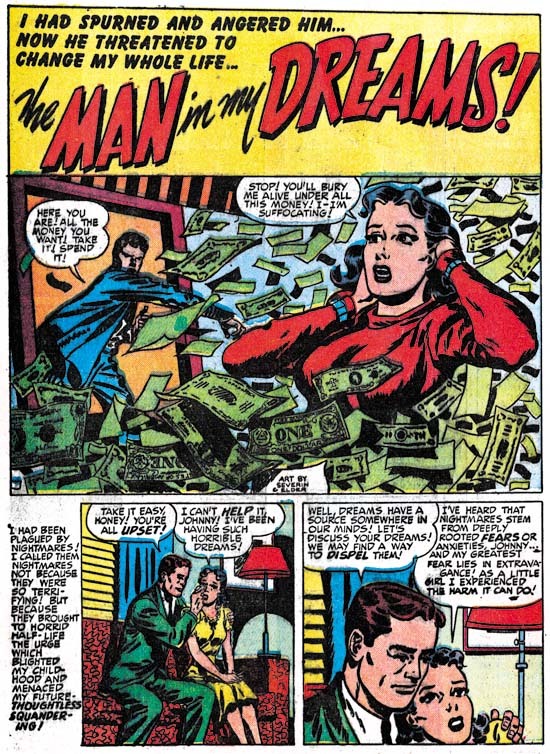 But it must be remembered that Jack was a boss and his income depended on the how good sales were for the S&K titles not on how many pages of art he drew. 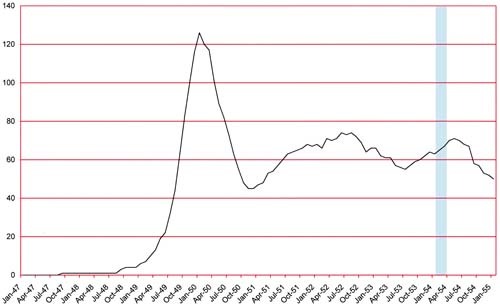 His decreased output could be due to nothing more then attention to some personal issues. 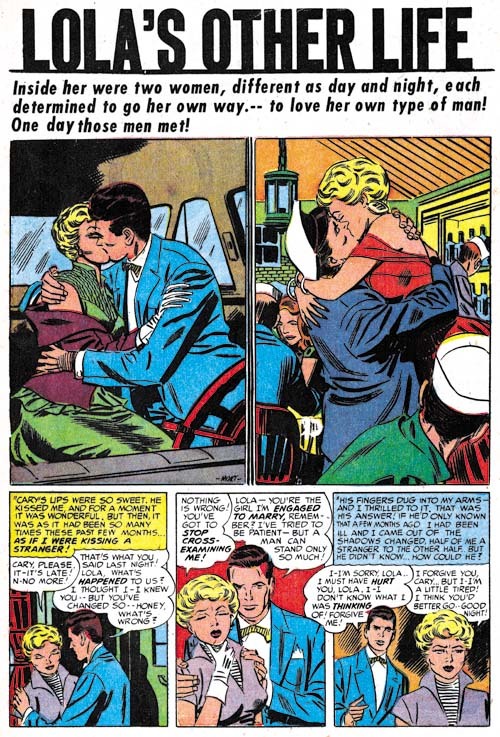 Most of the rest of the romance work was done by two artists; John Prentice with 25 pages and Marvin Stein with 24 pages. Three other artists supplied single stories. Two of them will be discussed below and the third has not been identified but only provided a single page. 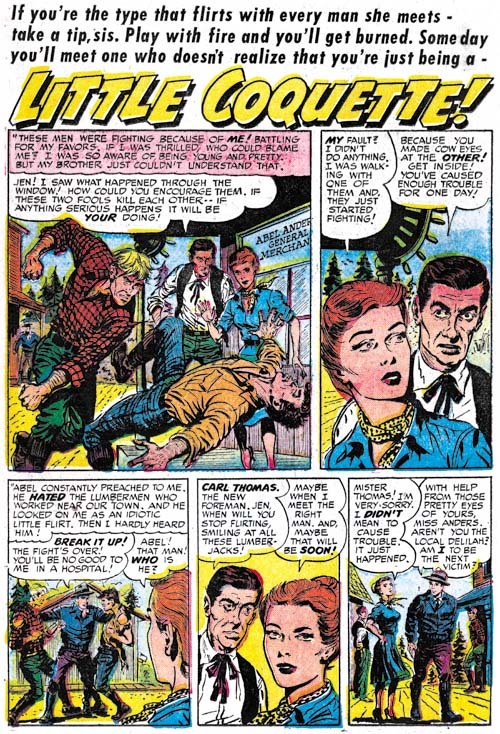 While his page count has dropped the quality of Jack Kirby’s work had not suffered. 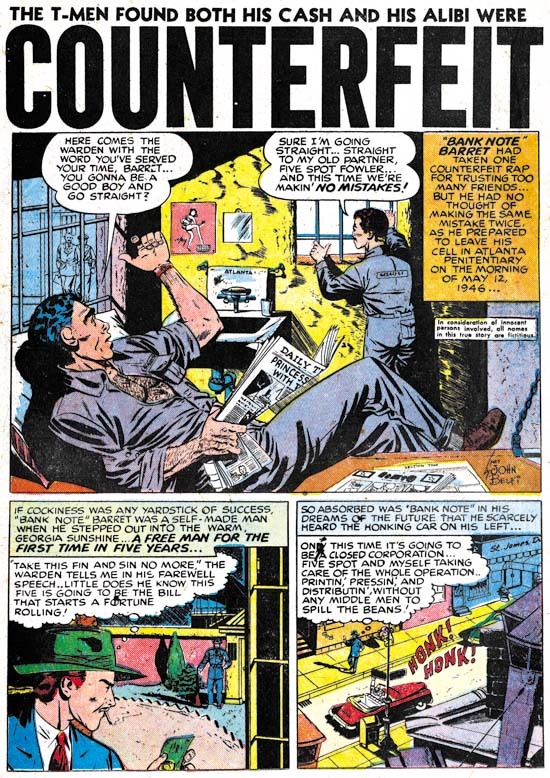 He still drew great splashes and his stories were still unique compared to other studio artists (suggesting that Jack was rewriting the scripts while he was drawing them). 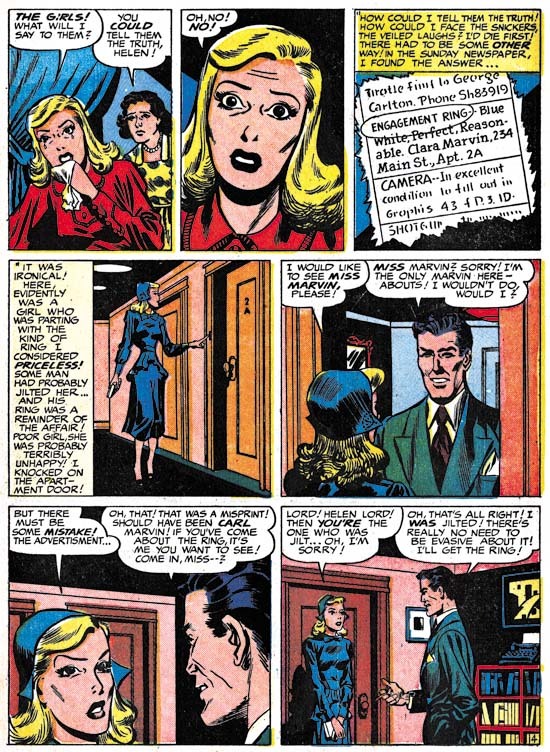 This uniqueness was often the result of placing more action into the story, something that Kirby excelled at. 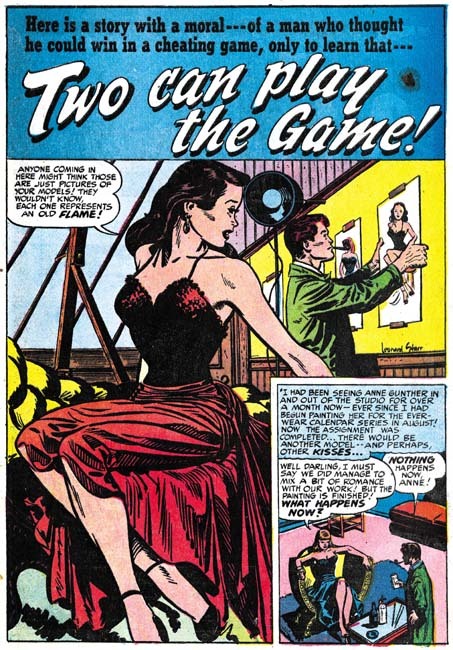 But as I have pointed out before, Jack also excelled at comic book art that did not rely on action. 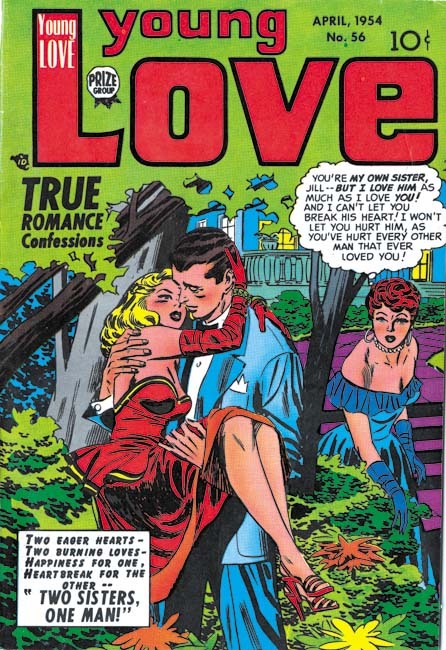 His romance splash panels are often examples of this. 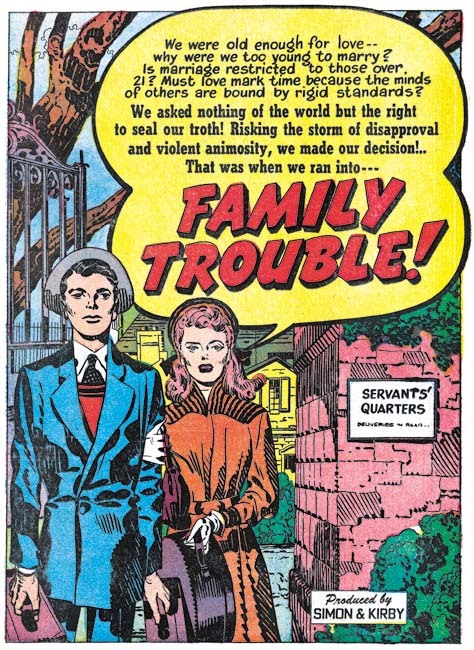 The splash for “Family Trouble” uses the confessional format that is so typical of Kirby’s lead stories. 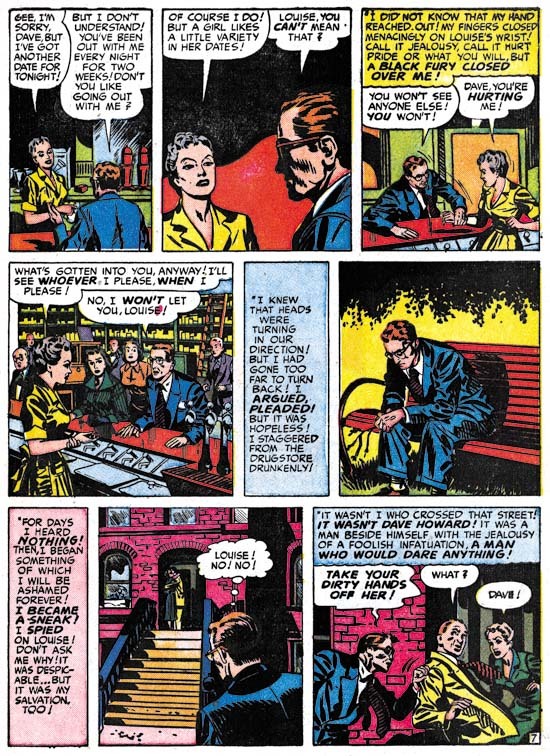 The word balloon that introduces the story provides the plot of young lovers facing family disapproval but does not explain the basis of their problem other then age. 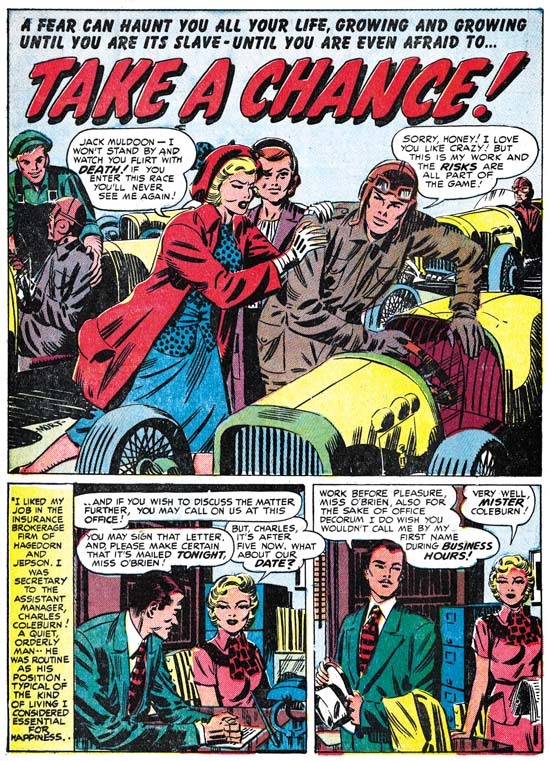 Kirby presents the couple passing through a gate carrying their luggage presumable off to start their new life together. 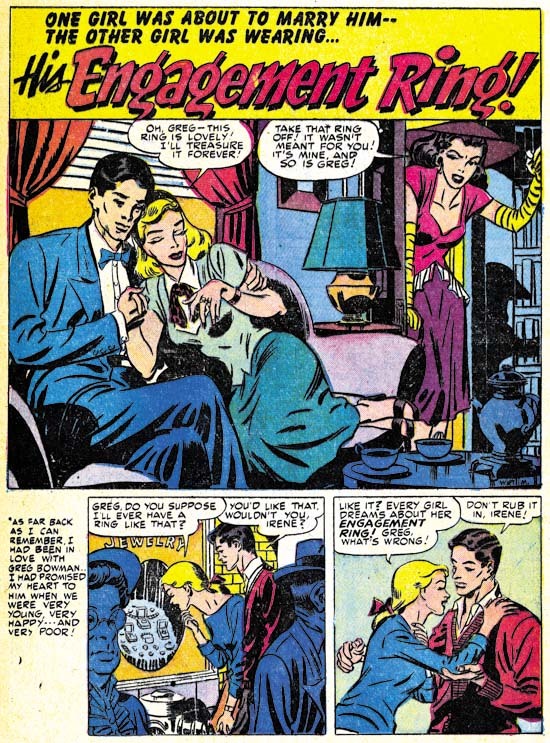 The sign on the entrance indicates they are leaving the servant’s quarters and therefore theirs is a romance that breaks the class boundary between the rich and their servants. The man seems calmed but resolved while the woman seems more resolute. At a glance this splash is nothing more the two standing figures but Jack embodies an entire story in it. Of course the viewer is expected to be enticed to read the story to get the full explanation. Kirby’s splashes are almost always interesting but occasionally they are quite unique. 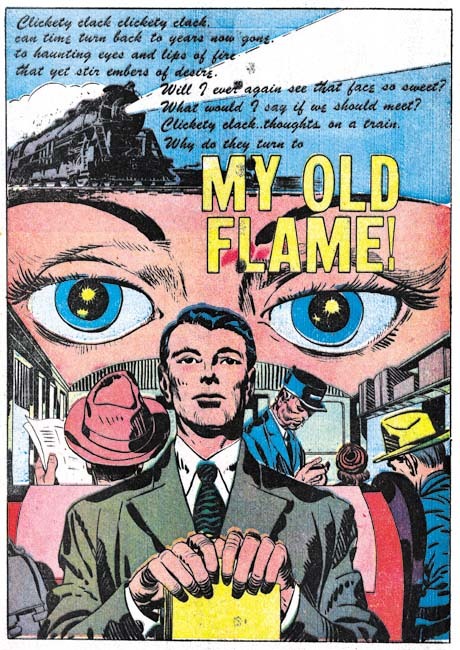 Given Joe Simon’s long history of innovative designs I suspect he provided layouts for many of Jack’s covers and splashes but even if that is true it still took a genius like Kirby to make them work so well. Here while riding a train a man pauses from reading his book to reflect on a past relationship. Normally the splash would be expected to show a head shot or half figure of the former love object. Instead we are provided with just a close-up of a set of eyes seeming arising behind the man; a compositional device that is much more effective in capturing the man’s mood. 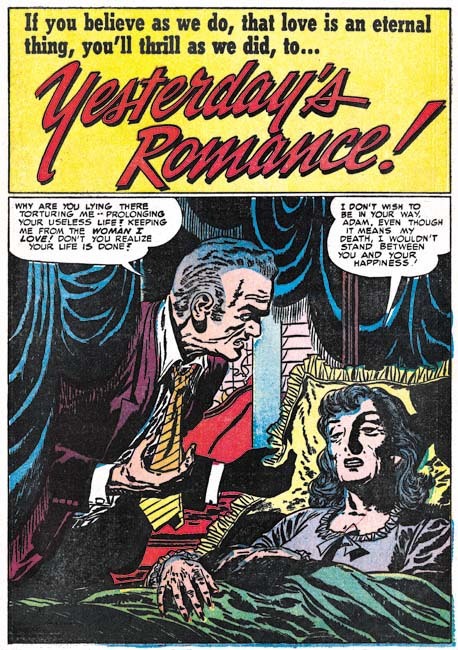 “Yesterday’s Romance” was the lead story for YR #36 that Bill did instead of Jack. It is an unusual story for any romance title because it main characters are all in their advanced years. Draut does a good job of capturing the offbeat nature of the story in his splash. 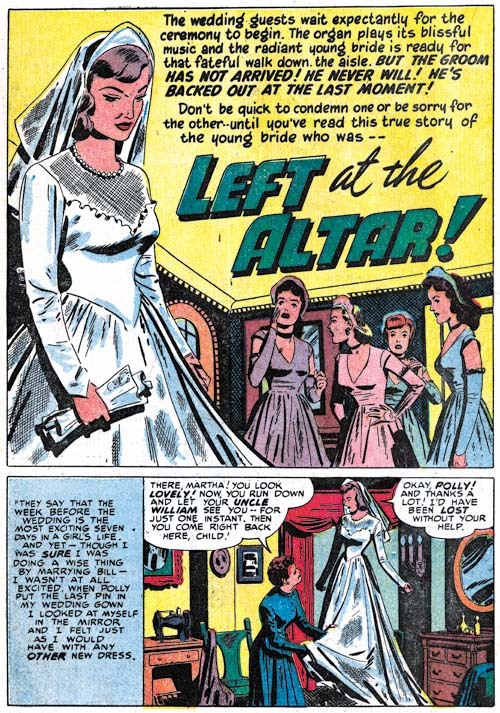 The odd thing about this piece is that usually the lead story used the confessional format where the protagonist’s speech balloon tells what the story is about and provides the title. 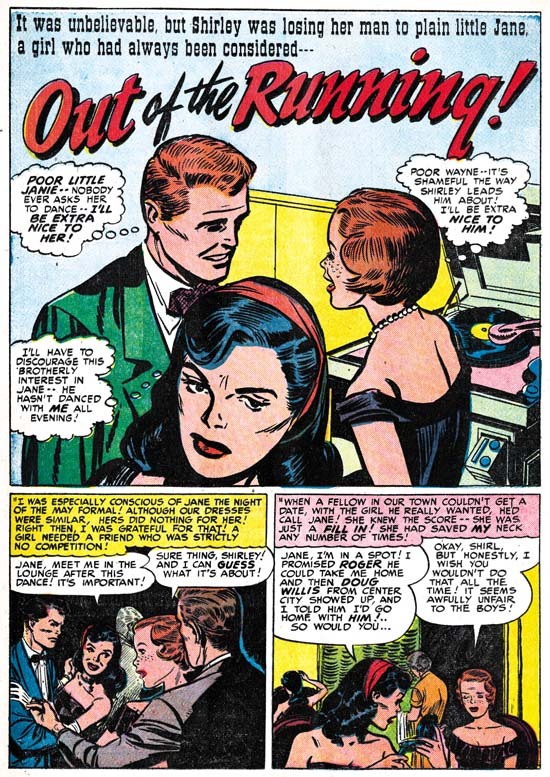 Bill has used that confessional splash before so he was aware of Simon and Kirby’s preference for using that splash format for the lead story. 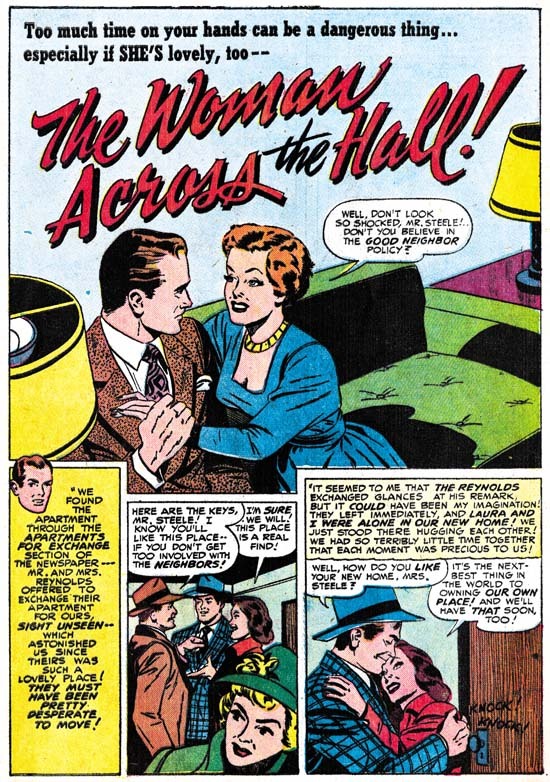 While “Yesterday’s Romance” failed to make use of the confessional splash it appears in the same issue in “Married in Haste”. 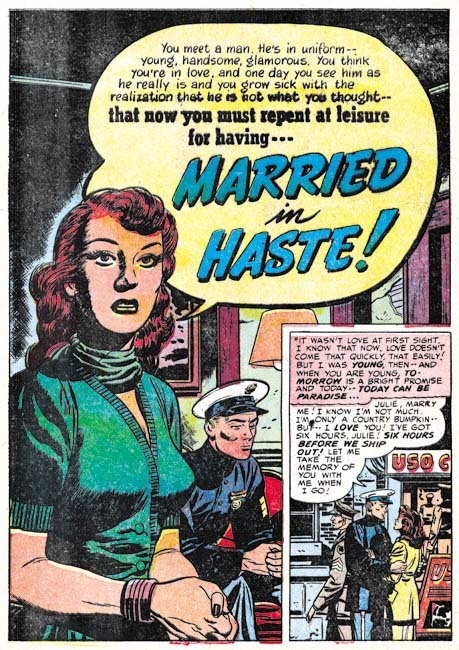 This suggests that “Married in Haste” was originally meant to be the lead story but its place was taken by “Yesterday’s Romance” after the art was completed. Bill does a good job with the confessional splash and as any good splash it succeeds in its roll as the story’s preview. 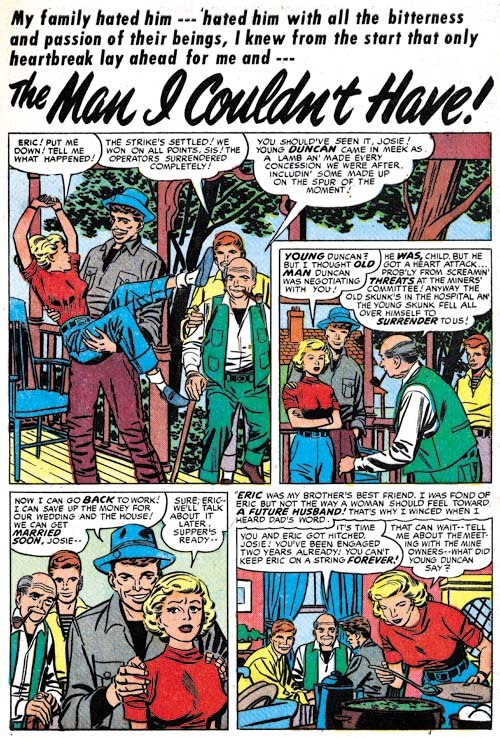 It may not be fair but it is constructive to compare the splash for “Married in Haste” with Kirby’s “Family Trouble” (shown above). Both do well at having the splash background support the story needed although it is not clear how much of this was the result of the artist and how much came from the writer. I describe the comparison as unfair because Kirby is such a great artist the comparison will tend to make Draut’s work poorer then the excellent art it really is. 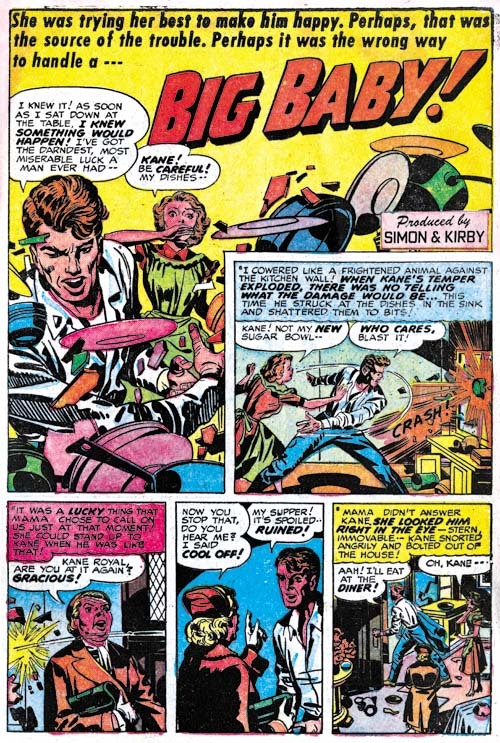 But the comparison is useful because it highlights the nuanced emotions Kirby gives his characters compared to the more static ones that Draut provides. 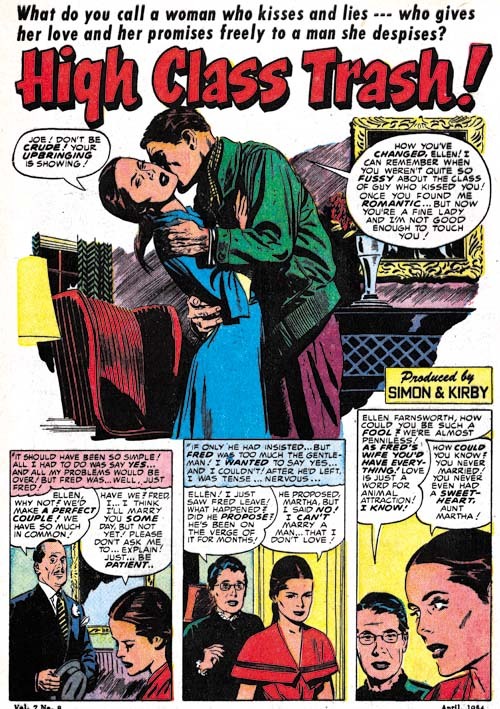 While Kirby is justly famous for the exciting action the work he did for romance pushed him to be equally adept at portraying more subtle emotions. 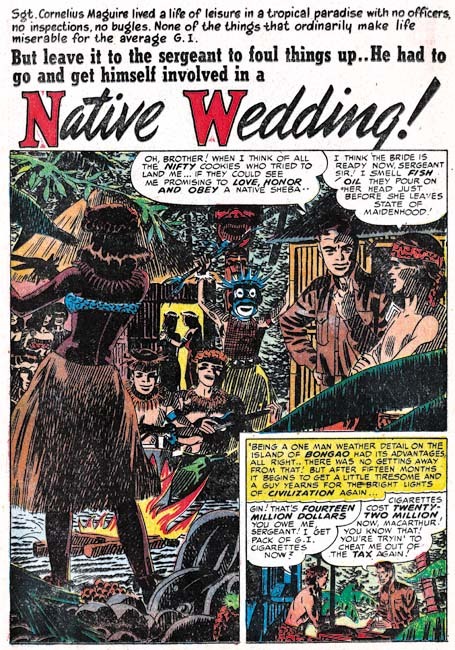 The splash for Meskin’s “Native Wedding” is reminiscent of the one Bruno Premiani did some time ago for YR #10 (June 1950, see chapter 11 of The Art of Romance). One obvious difference is that Meskin is uncharacteristic in his use of busy brushwork found throughout the splash. Normally this would result in the image loosing focus but somehow Mort pulls it off. Mort also takes care to make the camp fire scene occur at night providing the nearby faces shadowed from below as appropriate for the position of the fire. The dancer’s back is also appropriately shadowed. For a couple of pages of “Let’s Keep It Gay” Meskin adopts and 2 rows by 3 columns panel layout. 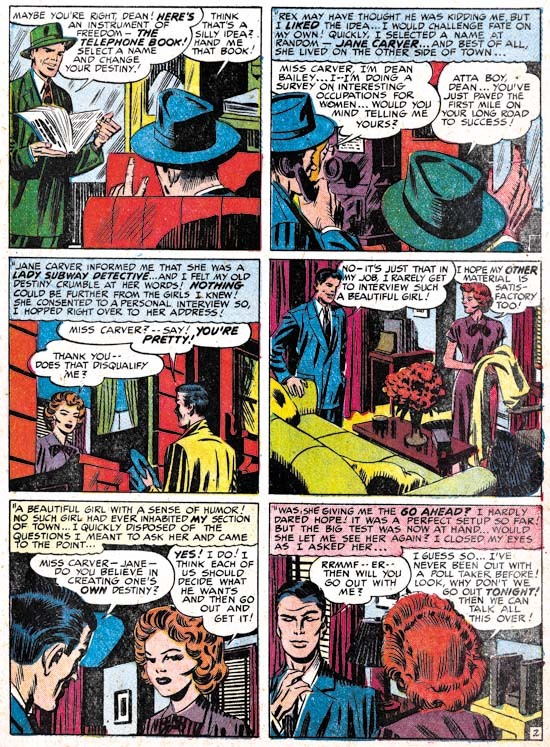 This results in tall narrow panels that Mort put to good use especially in the second panel of page 5. 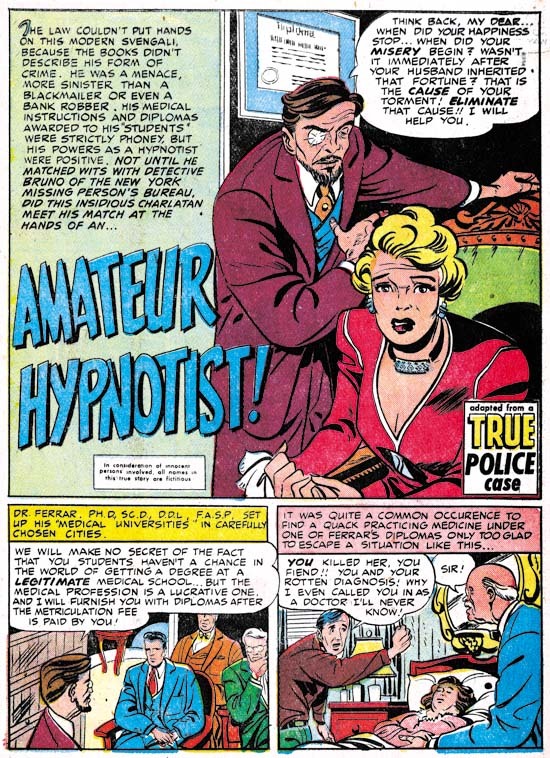 This panel layout was one that previously Leonard Starr was fond of using so one wonders if perhaps Meskin picked it up from him. 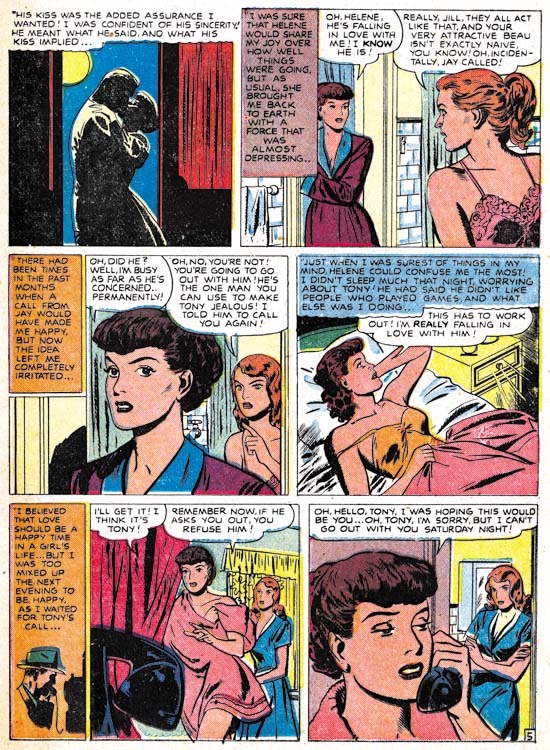 Starr also used a 3 rows by 3 panel layout where he would decrease the height of two rows so that the remaining row would have similarly tall panels. 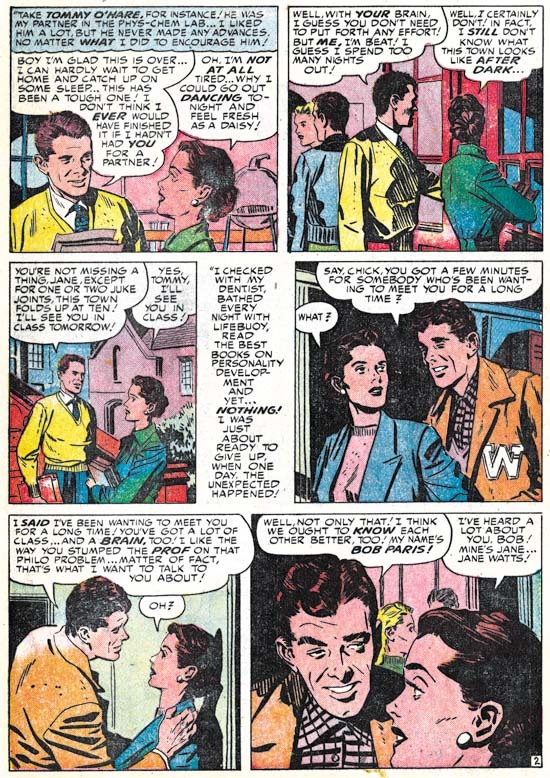 Starr’s modified 3 by 3 panel layout did not seem to be one the Meskin picked up on. 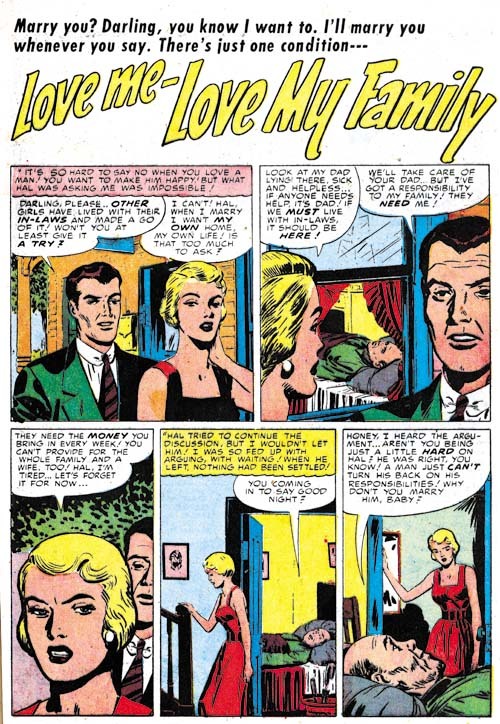 I particularly like how the bottom row starts with the couple in the foreground and a TV studio as the background, then Mort comes in for a close-up without the studio background, before ending by once again pushing the couple into the background of the studio. Careful manipulation of point of view was an important aspect of Meskin’s art during this period providing his stories with what could be described as a cinematic approach. 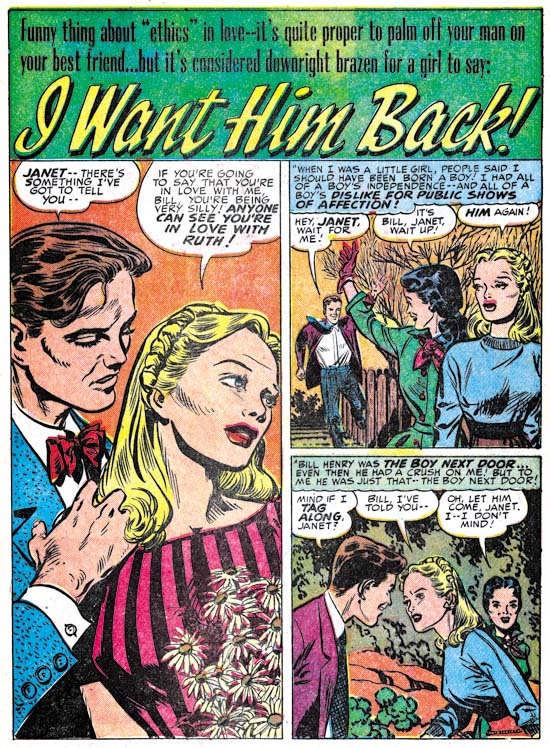 John Prentice has become a regular presence in Simon and Kirby productions, especially the romance comics. 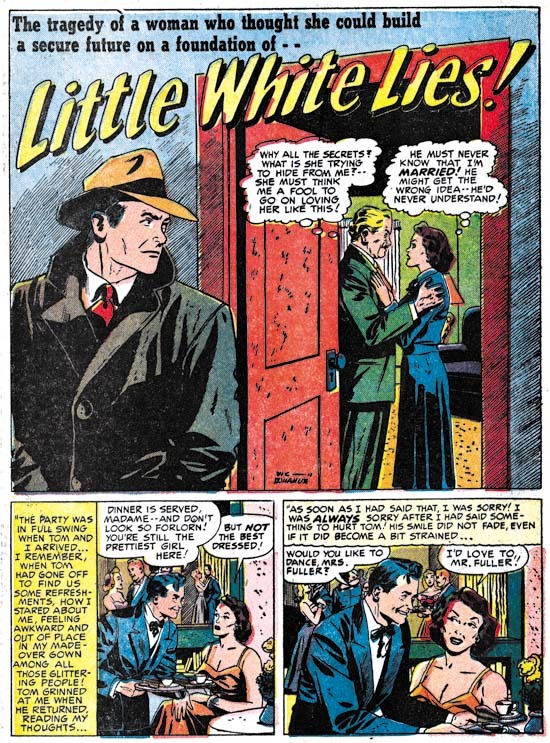 In the last chapter I provided an example where Prentice seemed to be adopting some of the Studio Style inking techniques. 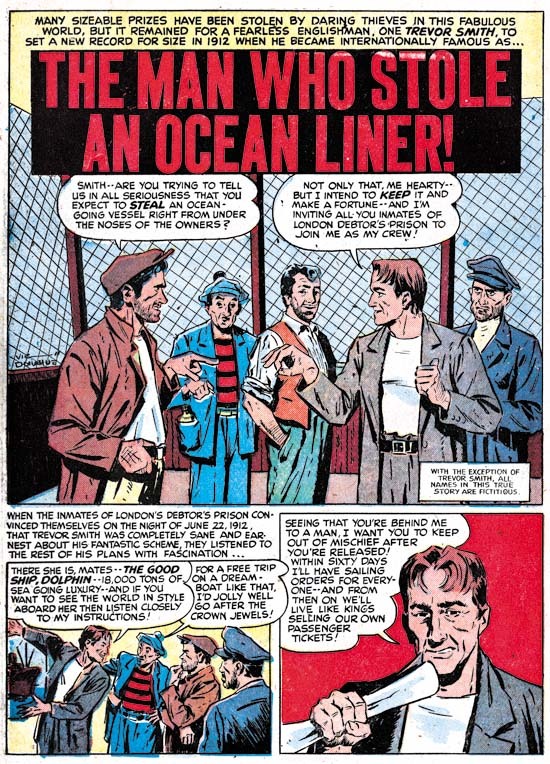 Although it was possible it could have been Joe or Jack touching up John’s work the picket fence crosshatching (see my Inking Glossary for explanations of some of my inking terminology) my opinion was and still is that it was the work of John himself. 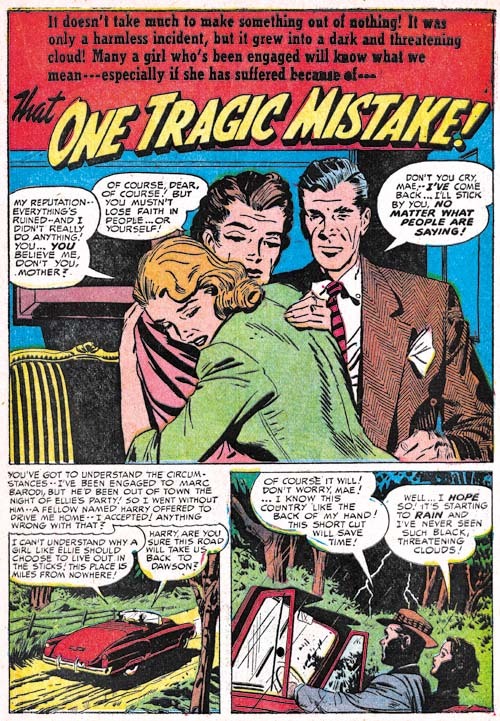 For the splash page of “One Tragic Mistake” we find a more typical Prentice inking. Note in particular his method of doing cloth folds. They are not the spatulate or oval shape typical of Kirby but tend to be long with roughly parallel edges and with a more or less flat and sometimes slanted ends. John also has a fondness for long sweeping cloth folds. Note the inking of the man’s shoulder. At a glance this might be mistaken for a Studio Style shoulder blot but see how it appears on only one of the shoulders and is clearly integrated with the shadow on the side of the face. With Joe or Jack I am never sure if shoulder blots were meant to indicate shadows or the turn of the form but Prentice always seems quite clear with his intent. 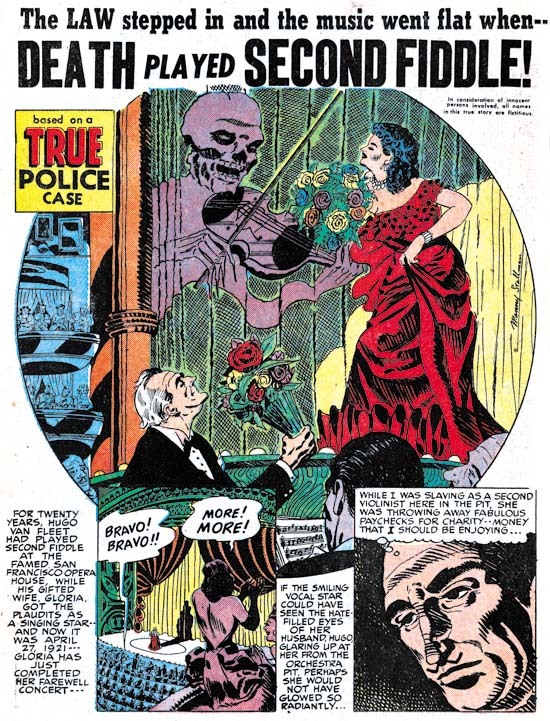 While the splash page to this story looks like typical Prentice inking other pages seem to be a combination of his own inking techniques and the Studio Style. 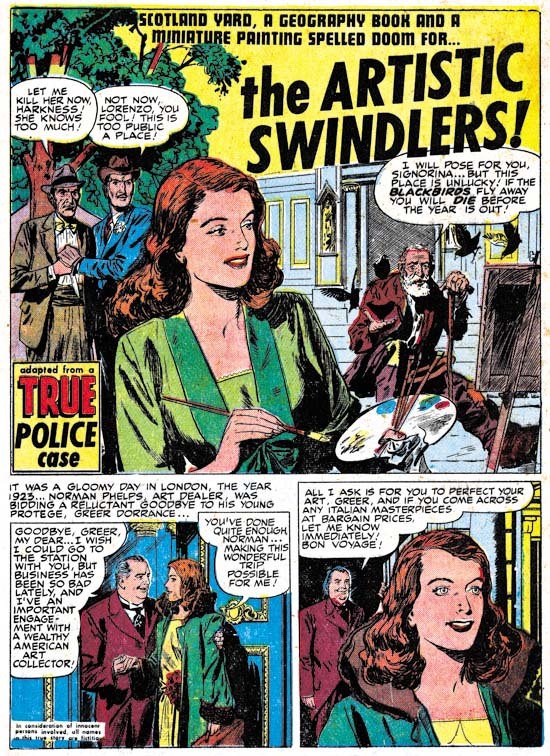 Most of the cloth folds are done in Prentice’s typical brush work but note the abstract arch shadows (panels 1, 2 and 4), picket fence crosshatching (panels 3 and 4) and shoulder blot (panel 6). Only drop strings appear to be missing. Panel 6 truly has shoulder blots because they appear on both shoulders while a shadow would only be appropriate foe the man’s right side. While I am not certain that the picket fence crosshatching was not by John, the abstract arches are so untypical for Prentice that I believe this is Joe or Jack stepping to do some touching up. 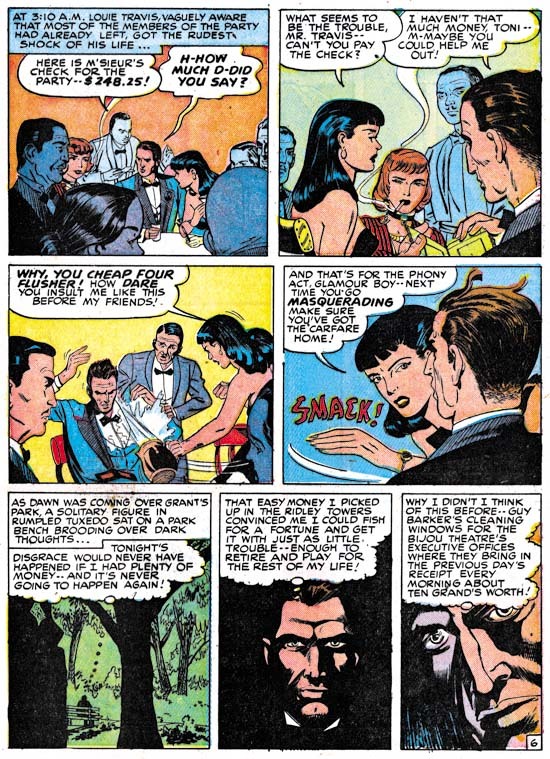 A page from another Prentice story from the same period provides a more typical example of Prentice inking. Again note the cloth folds some of which are long and sweeping and few could be called oval or spatulate in shape. There are some arching shadows that might suggest the Studio Style. But the round shape in the first panel is not abstract at all but is clearly meant to be the moon. The arc of the left side of the second panel is meant to be the entrance to an arched hallway. The shadow on the right side seems to be the light of the window falling on the darken exterior. Almost all applications of large areas of ink appear to be intended as realistic shadows. 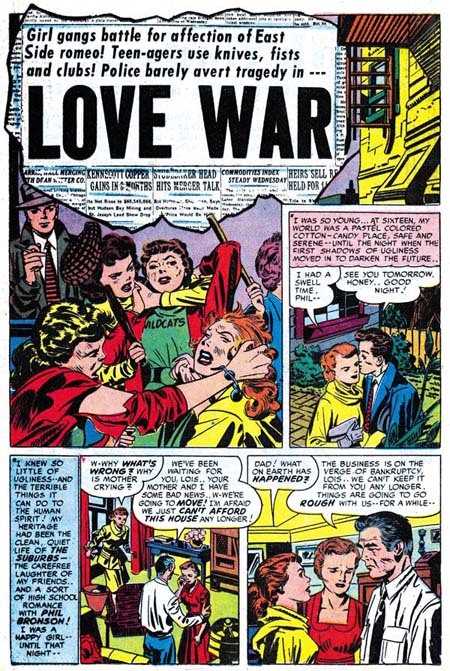 There is some picket fence crosshatching that again does not look typical of the brush work of either Kirby or Simon. 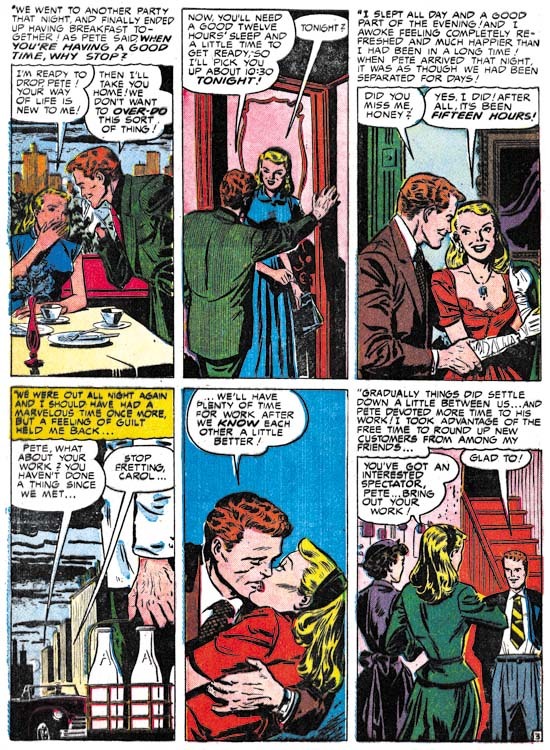 However note the picket fence crosshatching of the last panel. The pure black area on the man’s left shoulder seems an appropriate shadow but then the picket fence crosshatching on the opposite side does not. 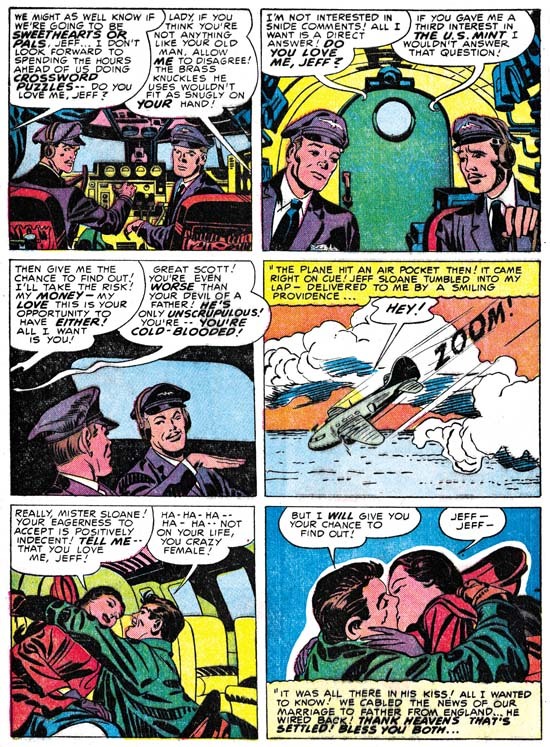 Since I have found both Simon and Kirby touching up other artists works distinguishing between their efforts and that of the original artists adopting Studio Style techniques can be a difficult conundrum. In John Prentice’s case I am still undecided. 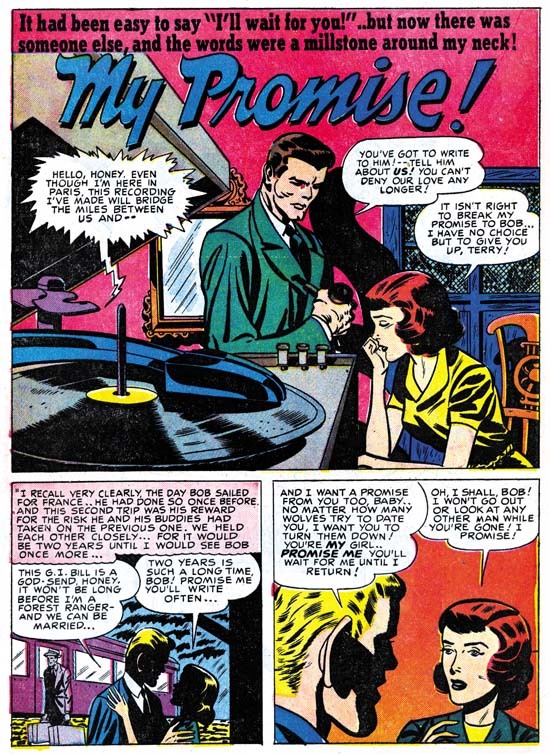 The distinction becomes important when trying to detect Prentice’s hand in the inking of work by Jack Kirby. 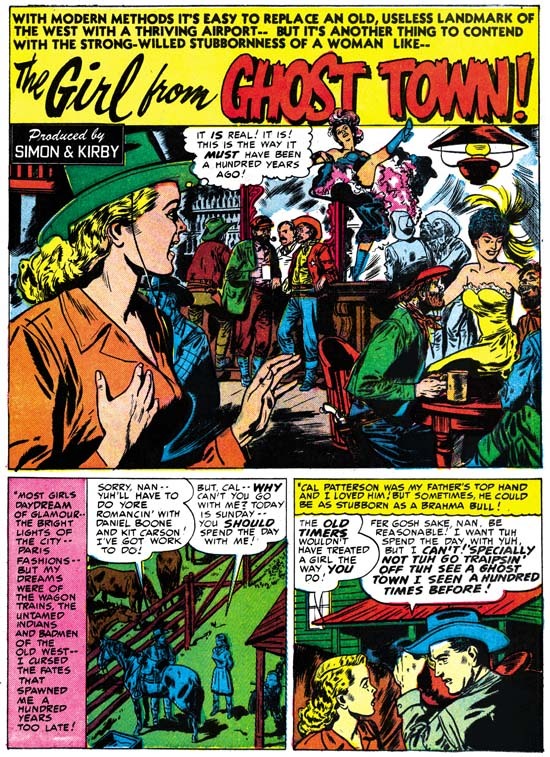 Some have suggested that John was the inker for some of Kirby’s art and he certainly is a candidate for that type of work. 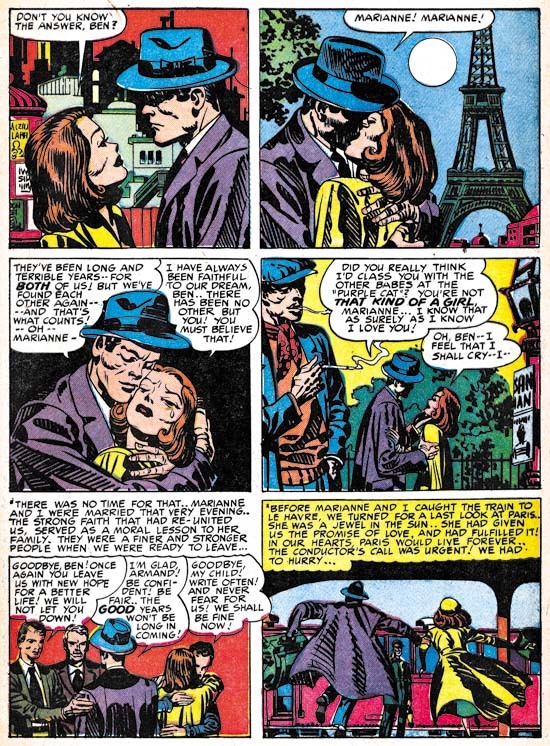 Previously I have had mixed feelings about Marvin Stein and in particular felt his romance art was little more then adequate. Even in the last chapter I noted his presence and gave an example image but did not provide more detailed examination. However Marvin had been working hard at improving his art and although signs of improvement have been noted before now his efforts really seems to bare fruit during this period. 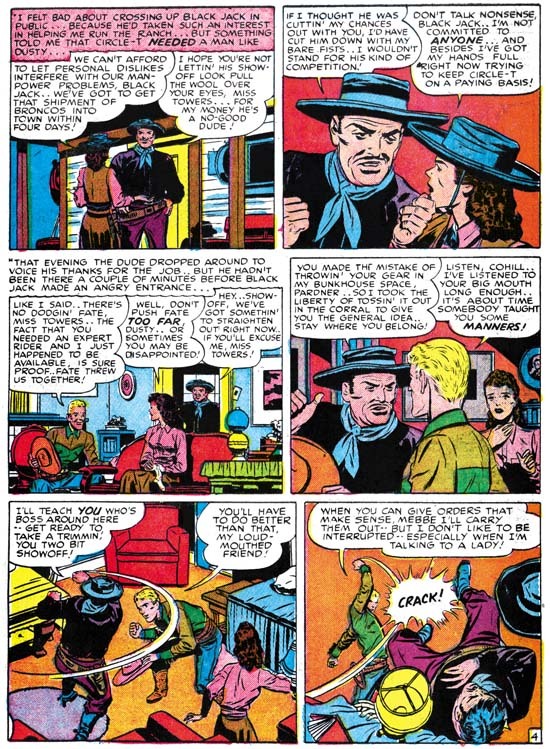 Marvin developed a style for his crime and western work that owed much to what he learned from Jack Kirby. For that more action oriented art Stein also developed an inking style that was blunt but well controlled; a style very suitable for the genre it was used on. 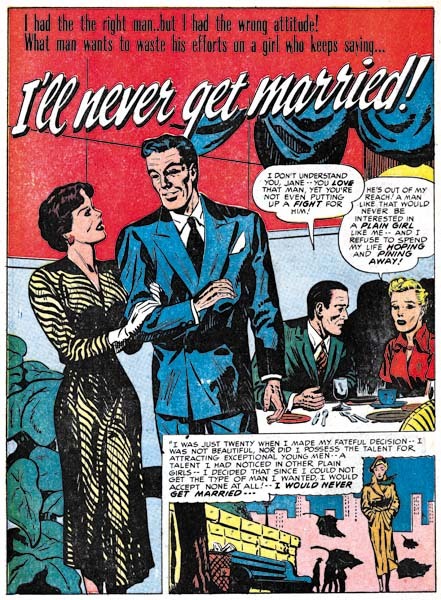 Neither the pencil nor inking style would be very appropriate for romance work so instead Marvin used a more refined style for both. 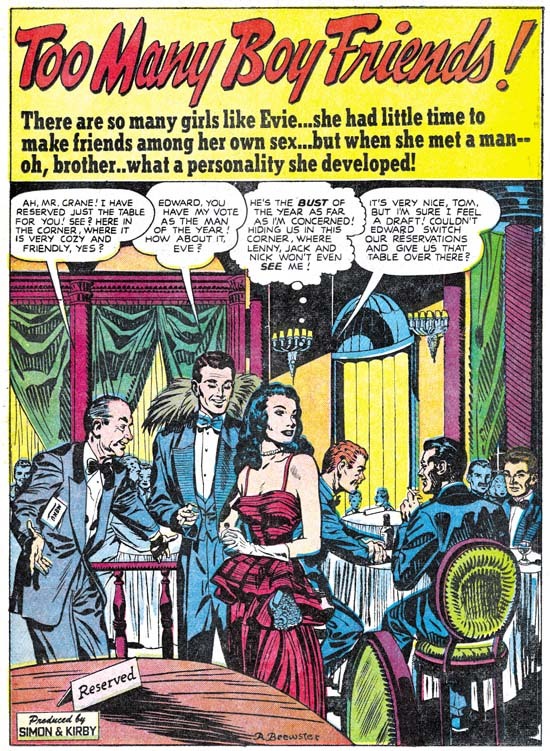 Not only was the bold inking brush restrained but Marvin sometimes used a pen to create crosshatching. 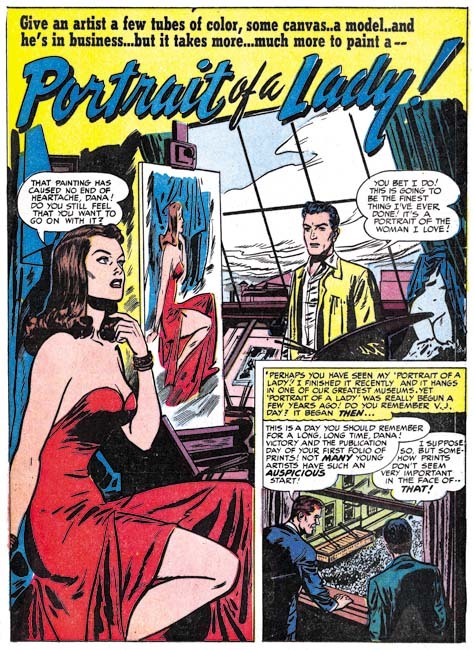 His figure drawing has improved but he still retains one of his earlier trademark tendencies to give his woman eyes that are set at an angle with each other. The splash for “Alice Finds Her Wonderland” is so special I could not resist including it. 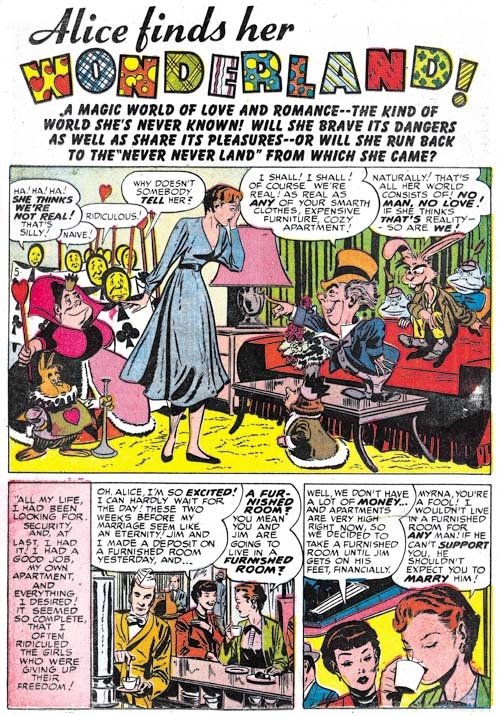 The Alice in Wonderland cast was probable requested by the script writer although the wonderland that Alice desires in the story did not include these delightful characters. 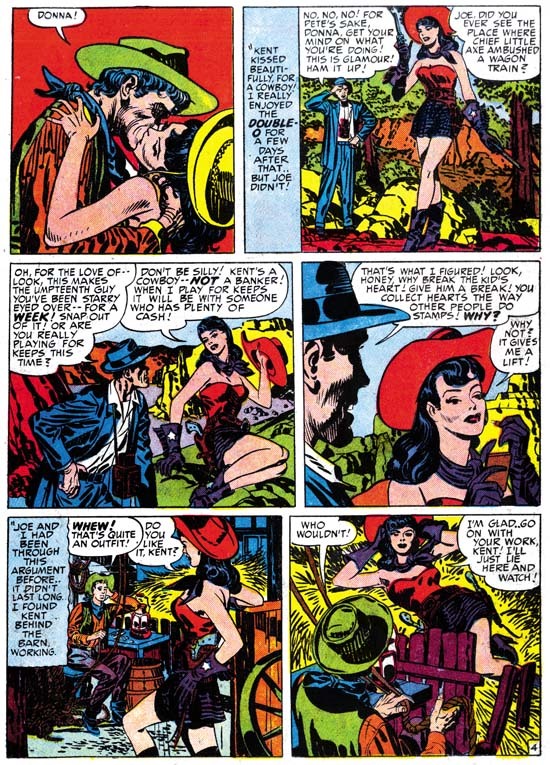 Having seen much of Marvin Steins work in the romance, crime, western and horror genres it is quite a pleasure to see him so successful at a more cartoon-like drawing. 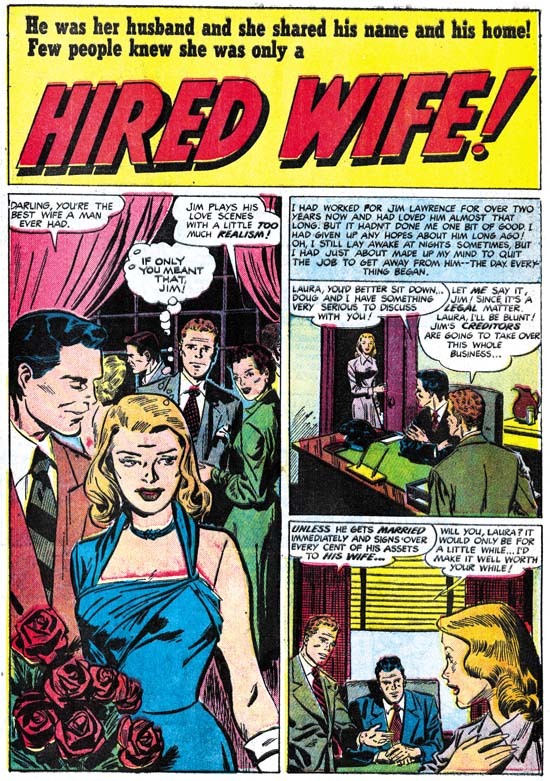 Vic Donahue has not made an appearance in a Simon and Kirby production for almost a year (last seen in YL #13, September 1950, see Chapter 11 of The Art of Romance). Even then I remarked that his art had been improving. Apparently that improvement has progressed so far that I almost did not recognize him in “Just Good Friends”. Even though this piece is unsigned enough of Vic’s mannerisms remain to credit Vic with this story such as the tilt he often gives the heads of females or the way he occasionally reverts to fine pen work often as simple hatching. 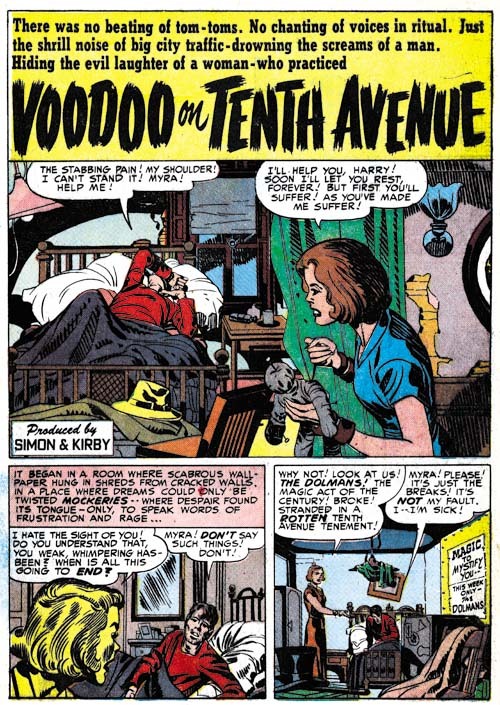 Vic also appeared in this same month in Black Magic #6 (Chapter 2 of the Little Shop of Horrors) in a signed piece but I have to admit I did not find that work particularly appealing. 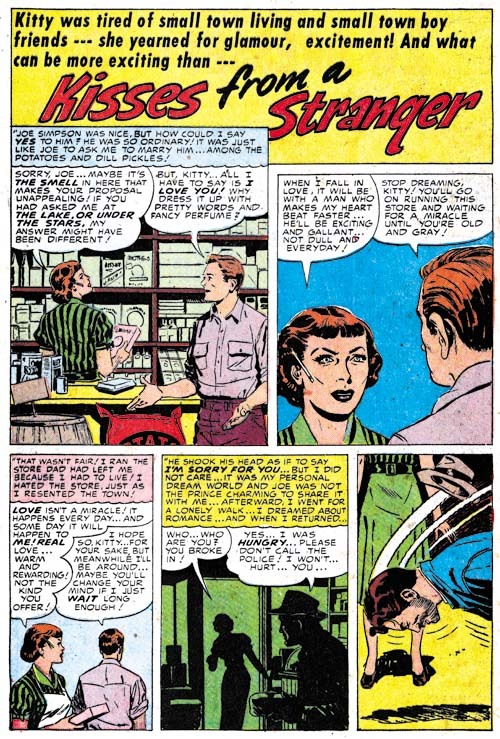 I am always impressed by the number of talented comic book artists that had worked for Simon and Kirby at one time or another. 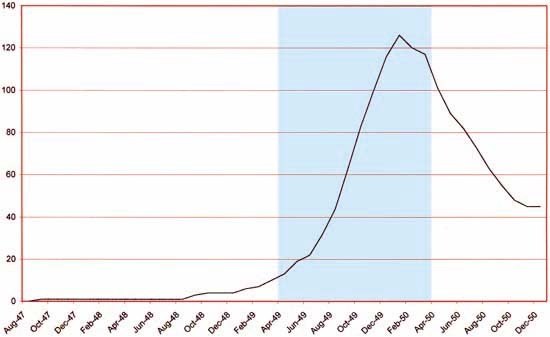 Some like Bill Draut, Mort Meskin and John Prentice did extended stays. 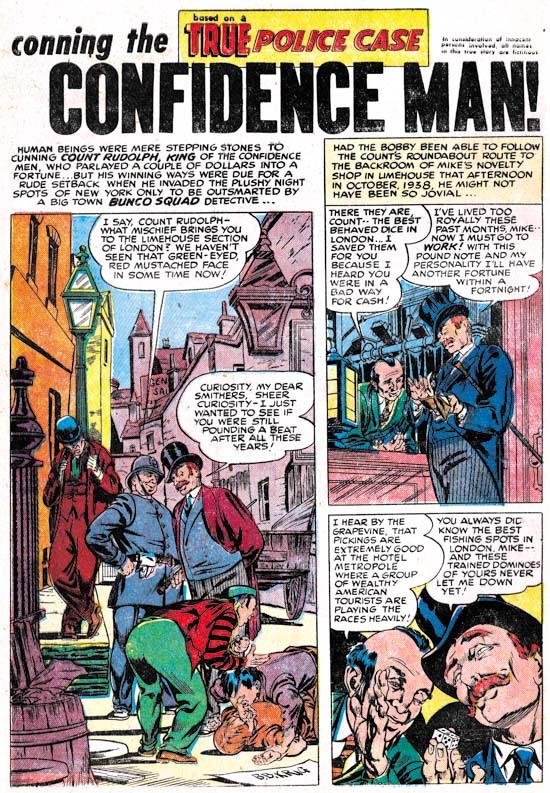 Others like Leonard Starr and John Severin worked for more limited durations but provided their share of work during that time. 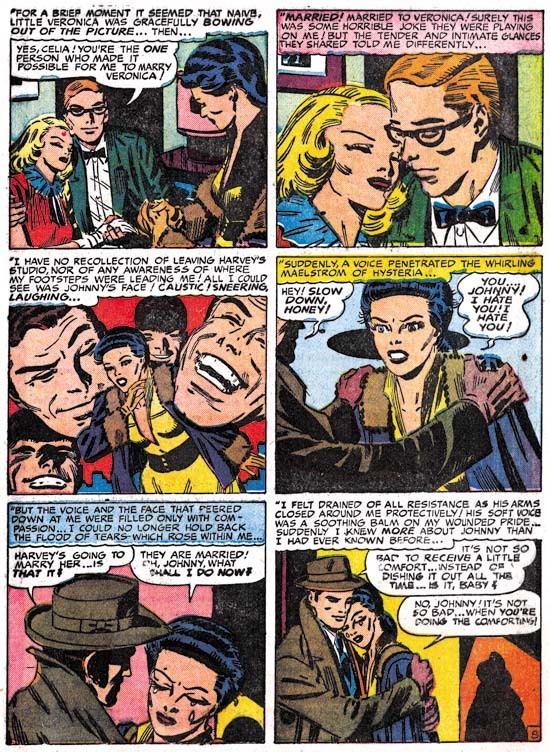 Yet others made brief appearances and only did a few pieces for instance Bernie Krigstein and Steve Ditko. 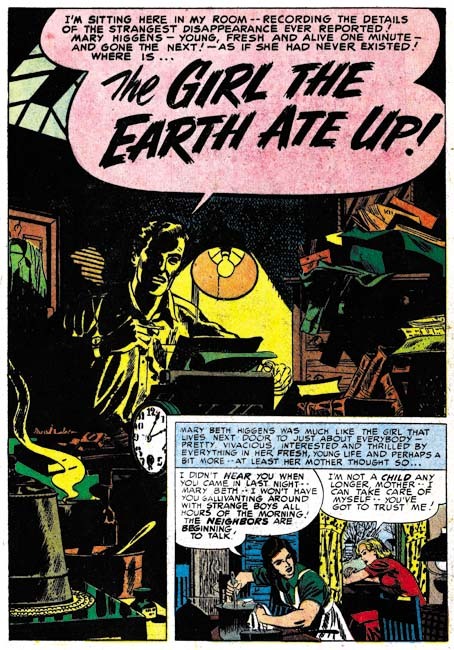 Ross Andru belongs in the last category. 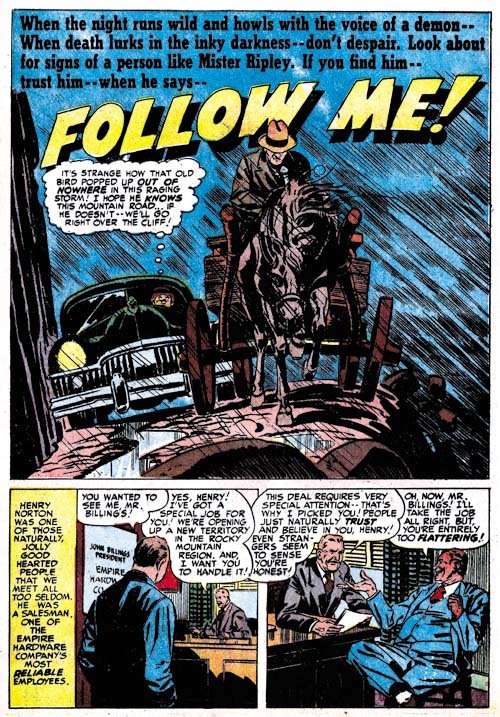 I must admit that I am not that knowledgeable about Ross Andru’s history. Most fans are probably familiar with him for the work he did many years later on Amazing Spider-Man. Andru was clearly an enterprising individual who formed his own company on three occasions. 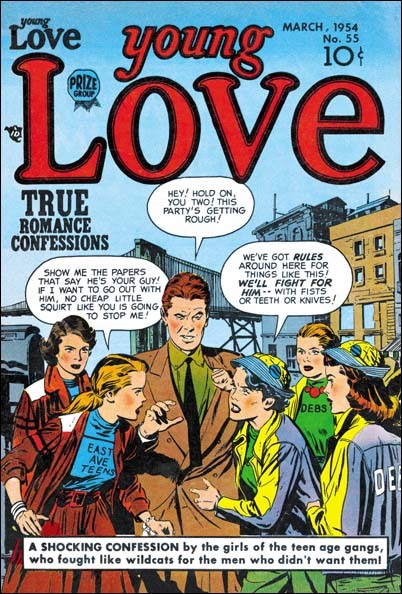 The earliest was in 1951 when he and Mike Esposito created MR Publications. I am not clear exactly what the nature of this company was. 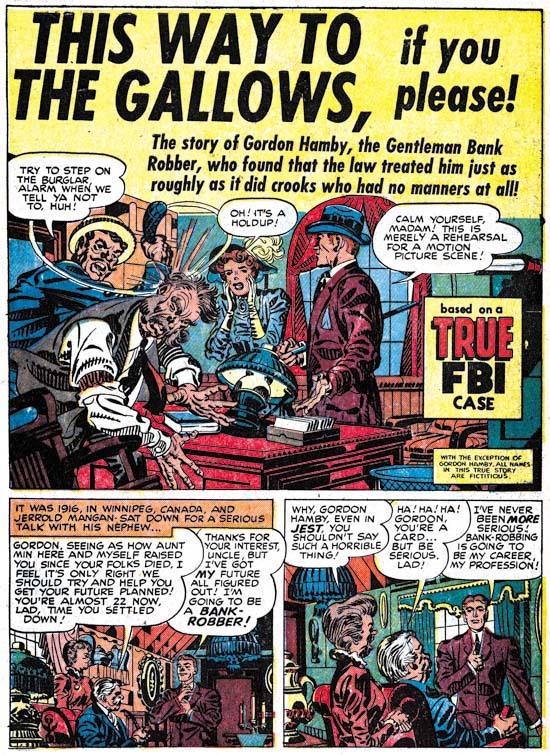 Some have said it was a comic publishing company in which case Andru and Esposito were three years ahead of Simon and Kirby’s Mainline (although Al Harvey was much earlier then them all). 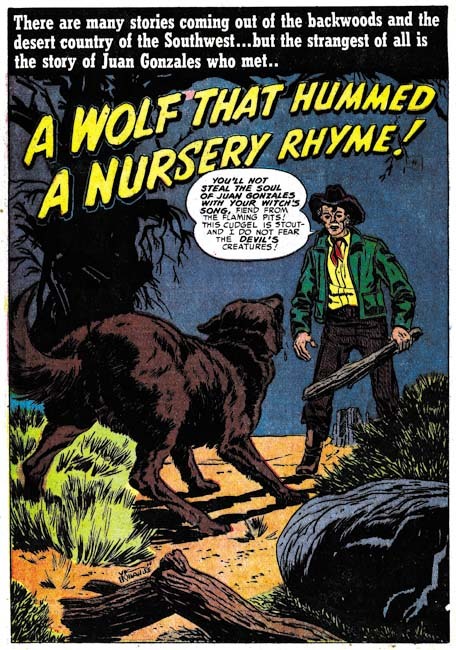 However I have been unable to determine what comic titles they published. 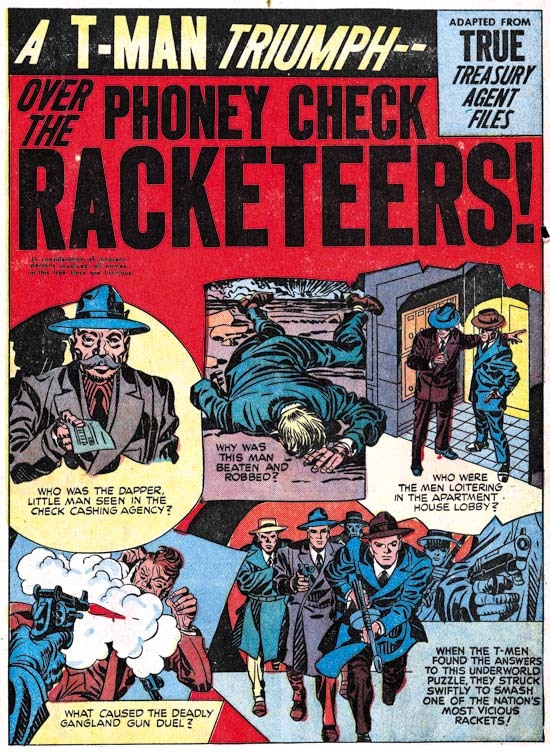 If MR Publications was actually producing comic books for another publisher to release then Simon and Kirby had been doing that for years (and Will Eisner doing it still earlier). 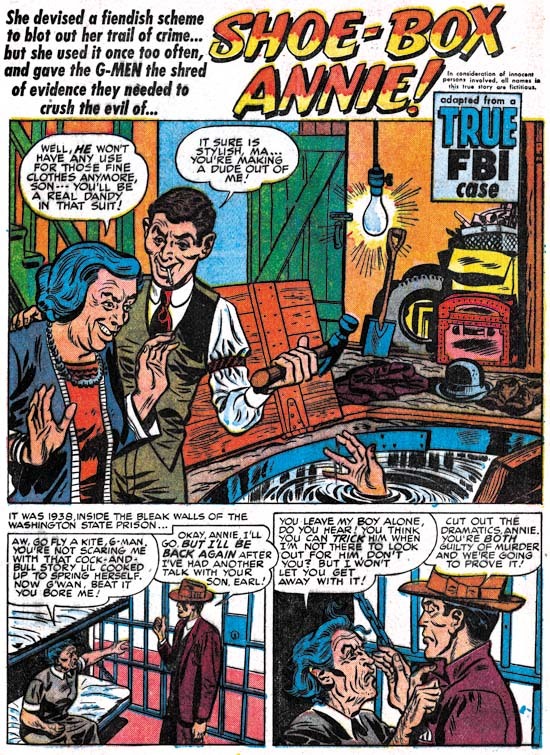 MR Publications was short lived and it would be interesting to determine the timing of that company or its demise and the appearance of Andru’s in Simon and Kirby productions. 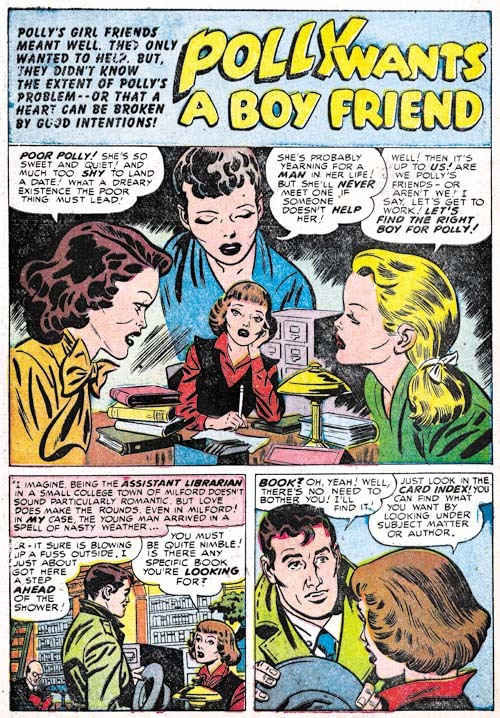 “Polly Wants a Boy Friend” is typical romance work by Andru. The sort of wistful expression with tilted head of the woman in the center of the splash panel can be found in some signed pieces from a few years later. 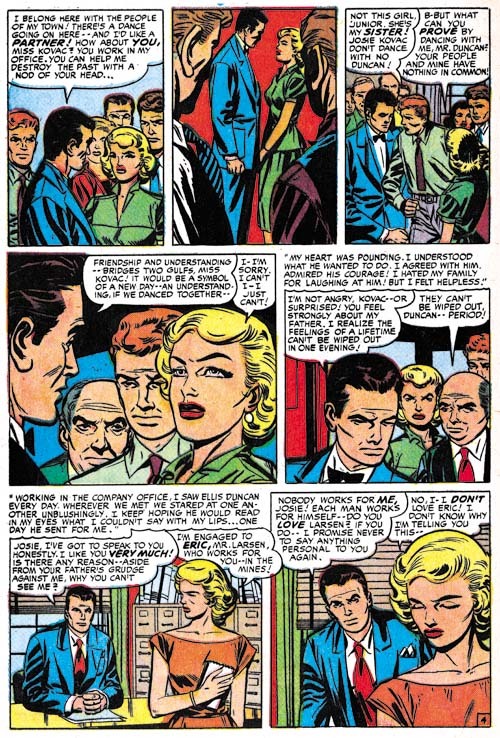 The man in the last panel of the page was also a dead giveaway of Andru’s style. Although unsigned I have not doubt about the correct attribution of this story. 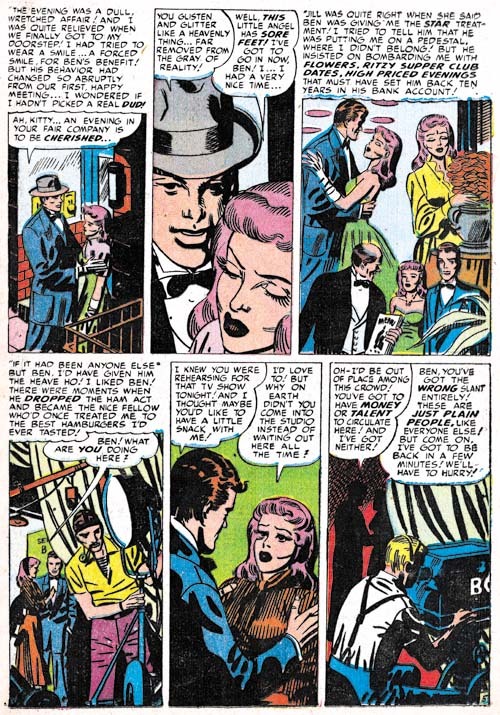 My database indicates Ross will appear in a couple more Simon and Kirby romances in the near future and again under different circumstances in 1954. Considering that Andru’s earlier pieces for Joe and Jack are unsigned there is also the possibility I will find more as my reviews progress. 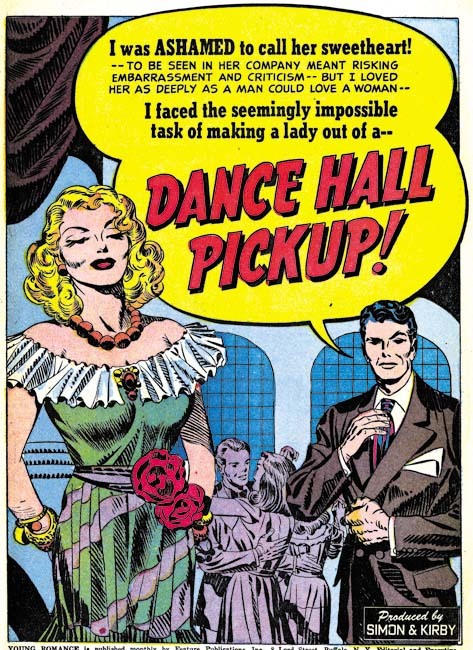 Black Magic #4 to #6 were released during the same period as Boys’ Ranch #4 to #6 (for Harvey Comics). 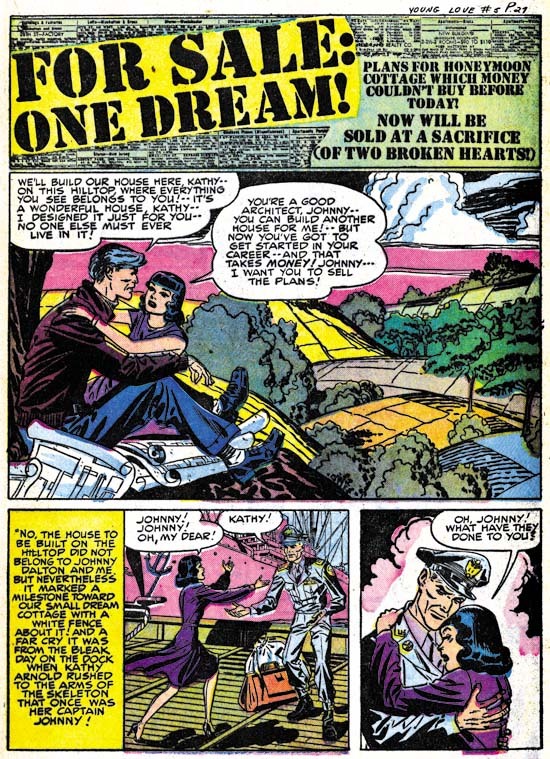 Both titles were bimonthlies which mean that the greatest amount of work produced by the Simon and Kirby studio was for Young Romance and Young Love both of which were monthlies. 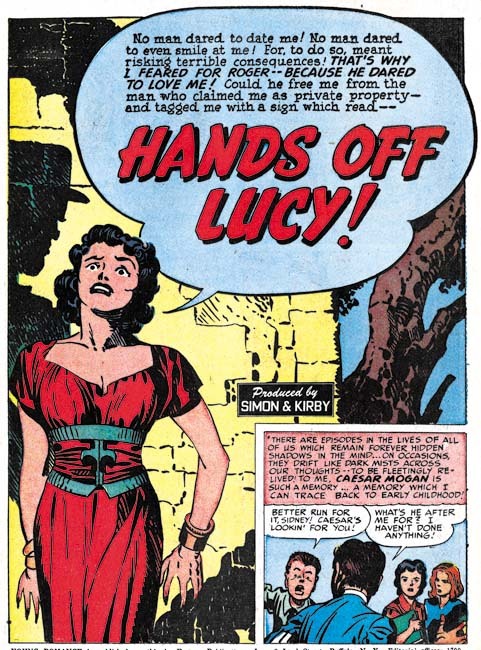 This is not at all unusual for while Simon and Kirby are most famous for their superheroes most of the work they did during their collaboration was for love comics. The period discussed in this chapter roughly corresponds with chapter 15 of my serial post The Art of Romance. 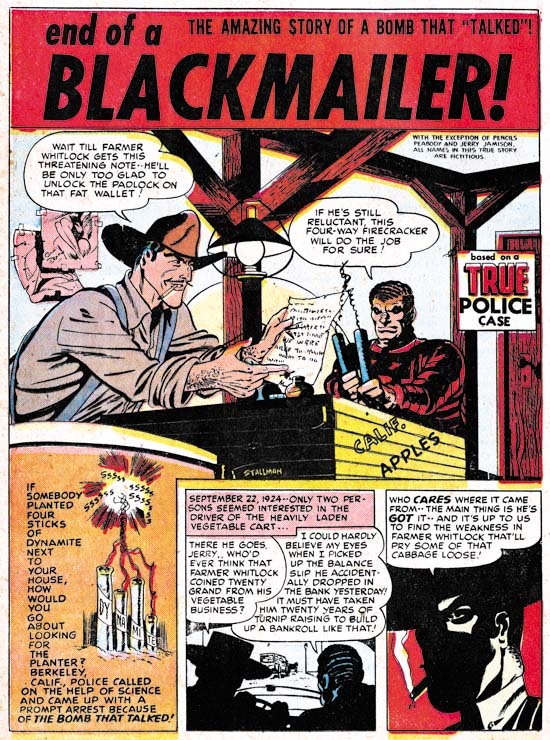 While Jack Kirby did all the covers for Black Magic (as he would throughout the first run) in terms of the number of pages drawn he was not the primary artist for Black Magic like he was in the earlier issues. That honors now went to Mort Meskin who did 37 pages compared to Jack’s 17 pages. 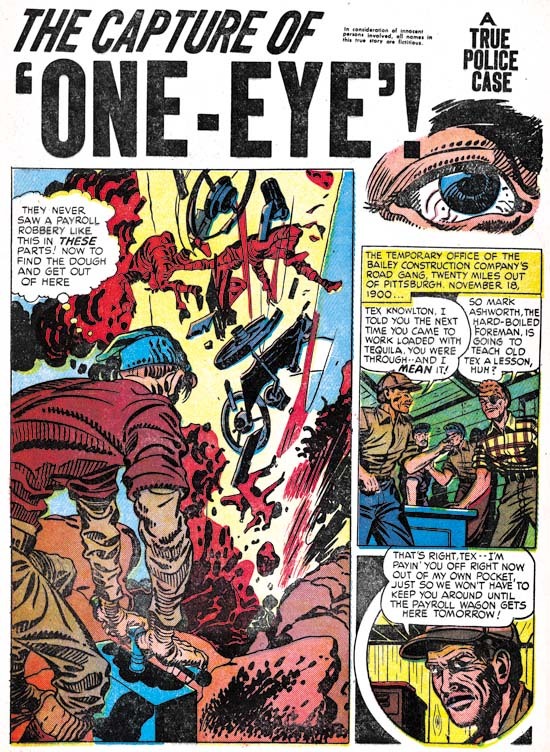 Even Bill Draut with 18 pages of art did more then Kirby. 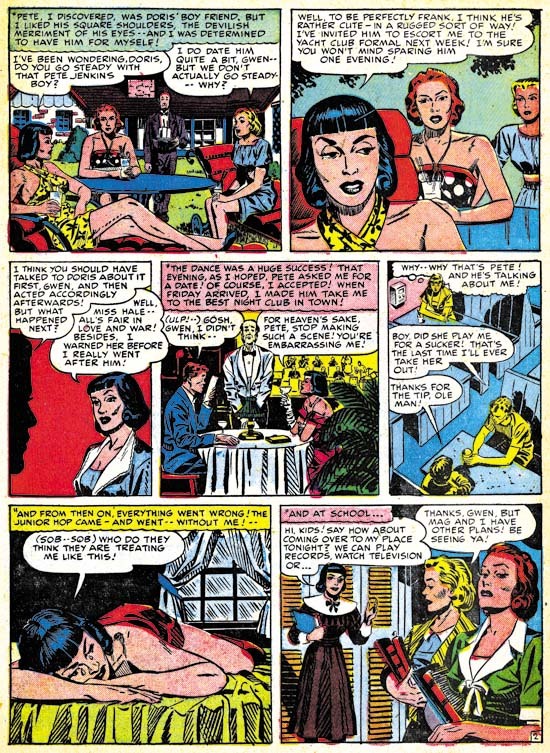 But even Bill was not the second most prolific artist in the issues covered; surprisingly that would go to the newcomer George Roussos who did 20 pages. 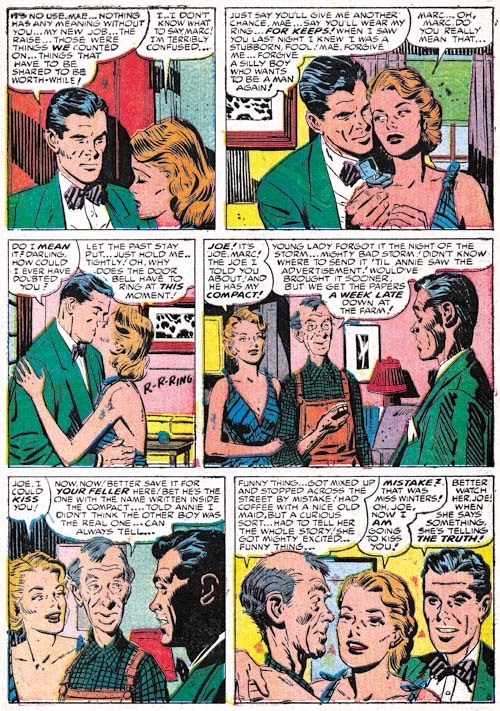 Vic Donahue who has been absent from Simon and Kirby productions for some months does a single 5 page story. 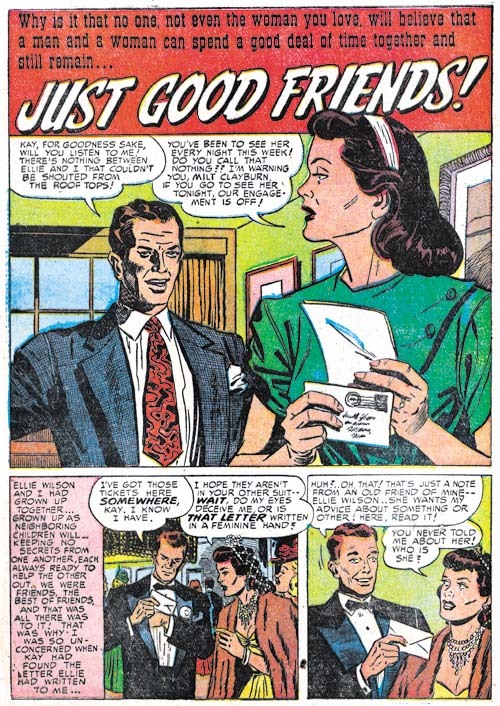 John Prentice is new to the studio and only provides a single 7 page story. Two stories remain without attributions but one of them is a single page feature. Kirby has scaled back on his splash for his only large piece for Black Magic. Still even with half a page Jack could get a lot of impact. It is amazing how Kirby has managed to make the woman both beautiful and evil; no haggard witch here is just a cold and angry heart. 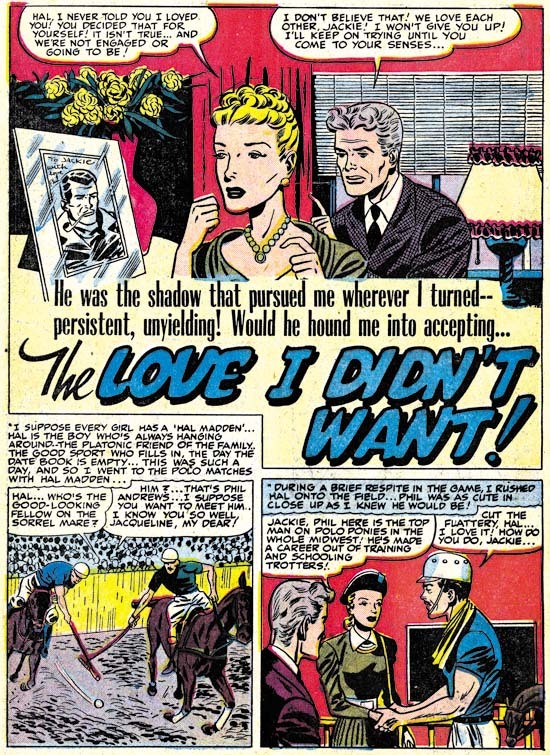 What a text book example of the use of abstract arch shadows (see my Inking Glossary). I count 6 of them in this small splash. 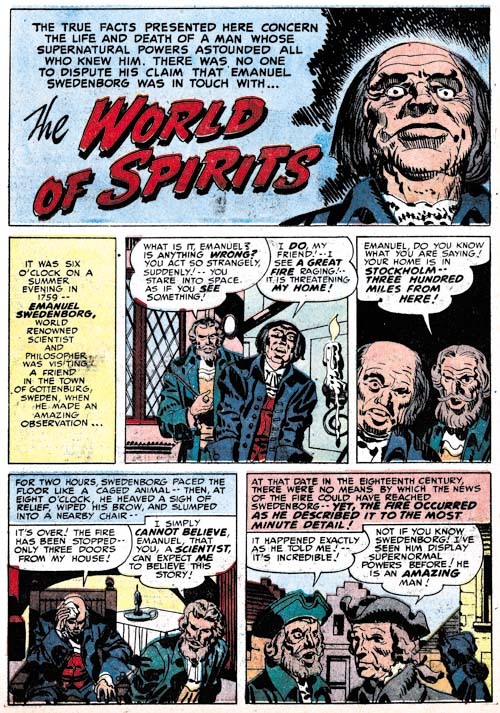 While Kirby’s other contribution to Black Magic #4 to #6 were very short pieces one of them, “The World of Spirits” is not to be neglected. It is a small masterpiece. 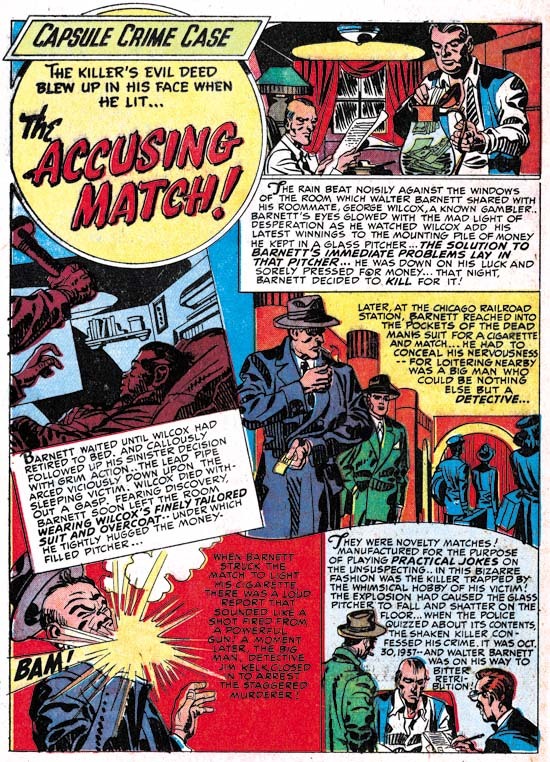 It is one of those cases where Jack, so famous for his action, has managed to make exciting art out of nothing more then talking heads. Part of what makes a page like the one shown above so vital is how Kirby changes the expressions in every panel. Since the characters are all past their youth Jack can push his already exaggerated eyebrows to much advantage. The inking is also superb. 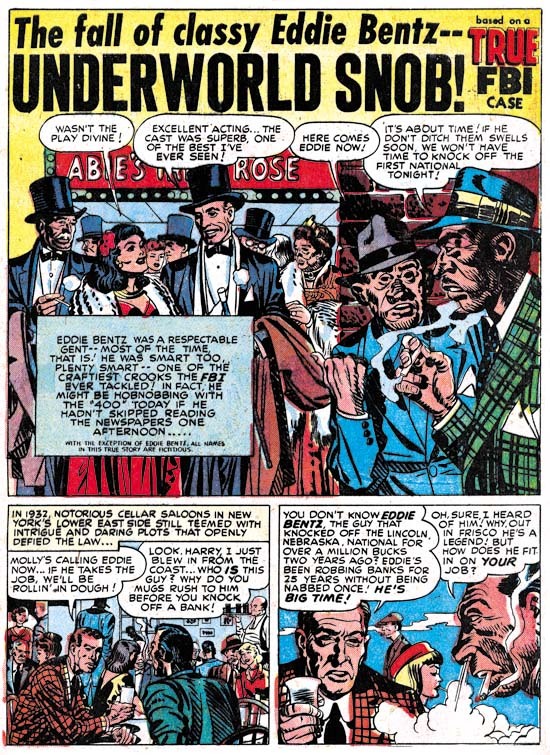 I am not one to automatically attribute good inking jobs to Kirby but the way the spotting is done on the white shirt in the splash and the use of bold cloth folds make me believe that at least much of the spotting was done by Jack himself. 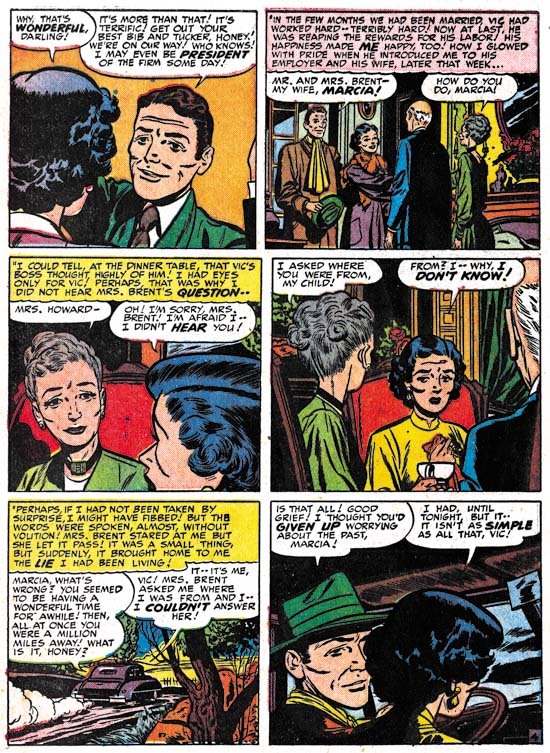 A lot of the times these very short pieces just did not seem to get the same attention from the various studio artists as they gave to the more substantial stories. 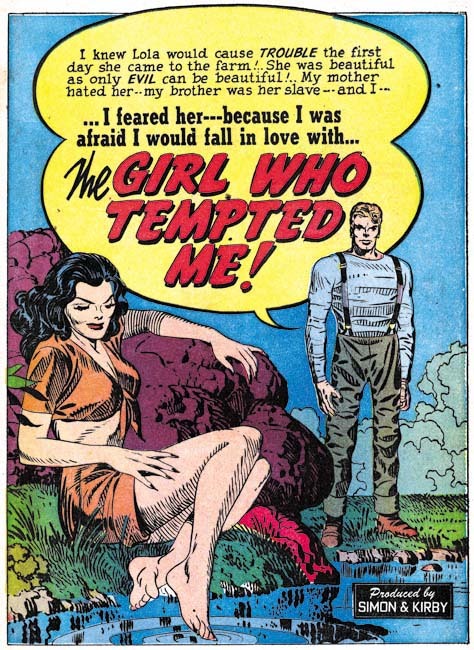 But not Kirby; some of his greatest masterpieces are short stories such as this one. 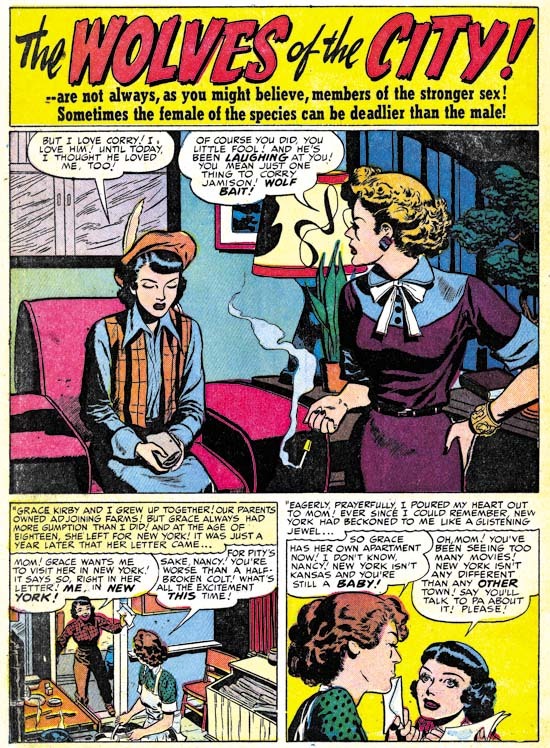 I am afraid I am giving short shift to Mort Meskin by only including one example despite the fact that he produced far more work then any other artist. 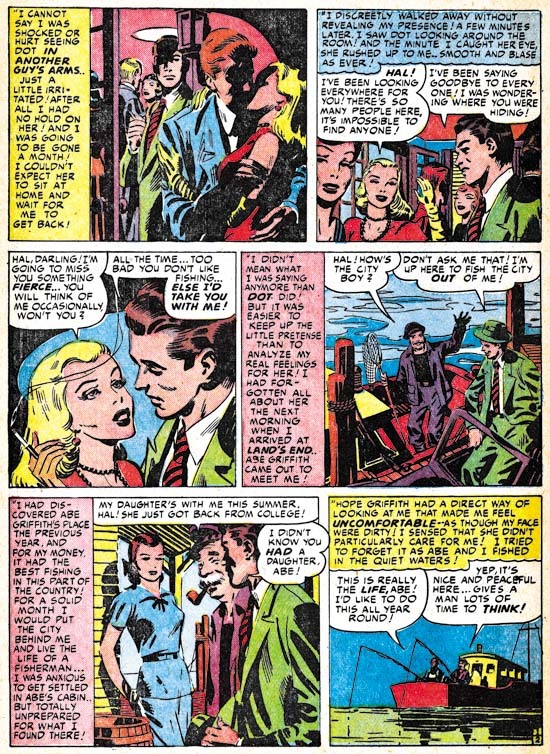 This certainly does not reflect on the quality of the work that Mort was producing; Meskin’s Black Magic work is among the best that he ever did. 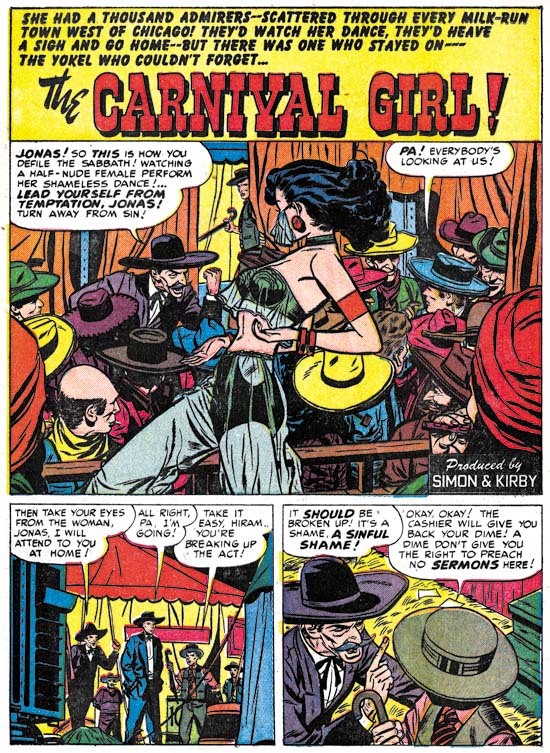 I admit that Mort did some great work for DC after leaving the Simon and Kirby studio but that unfortunately was done under the severely detrimental effects of Comic Code censoring. I have selected this particular splash page because of its unusual design. Not that the half page splash is so visually different but the fact that the splash panel is actually the first story panel. 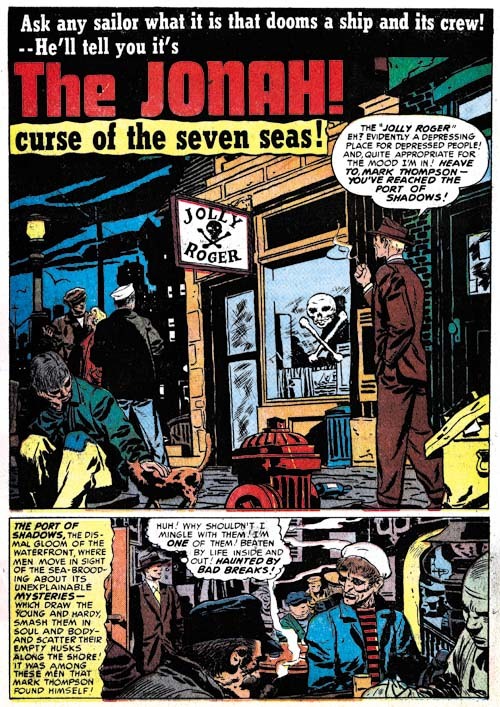 Typically splash panels are used as the comic book equivalent of a movie trailer; they provide a sort of a synopsis of the story to entice the reader. 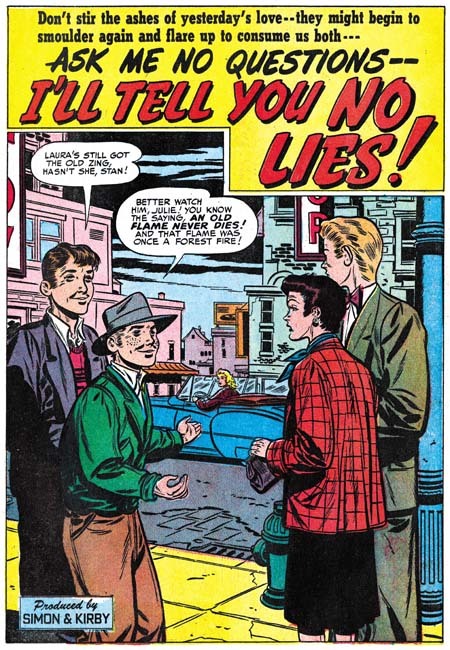 I do not remember a story splash panel being used in any prior Simon and Kirby production. 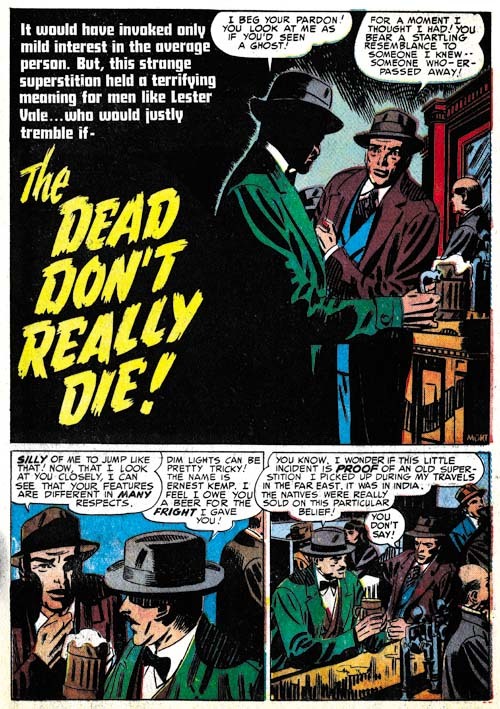 The use of this device in “The Dead Don’t Really Die” is still pretty much an isolated case but it would become very typical of Simon and Kirby romance comics in the future. 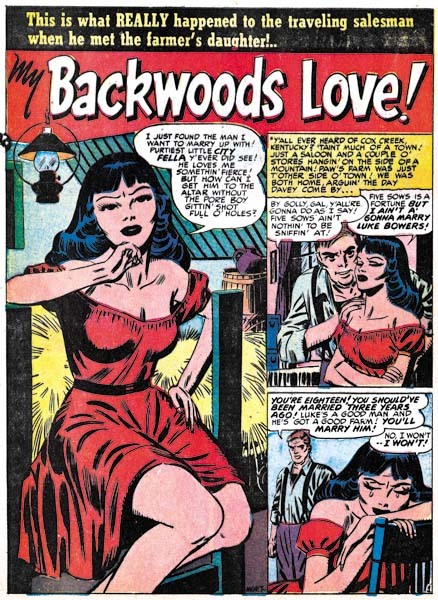 Black Magic seems to have given Bill Draut the confidence to draw the type of characters that had all but disappeared from his romance work. 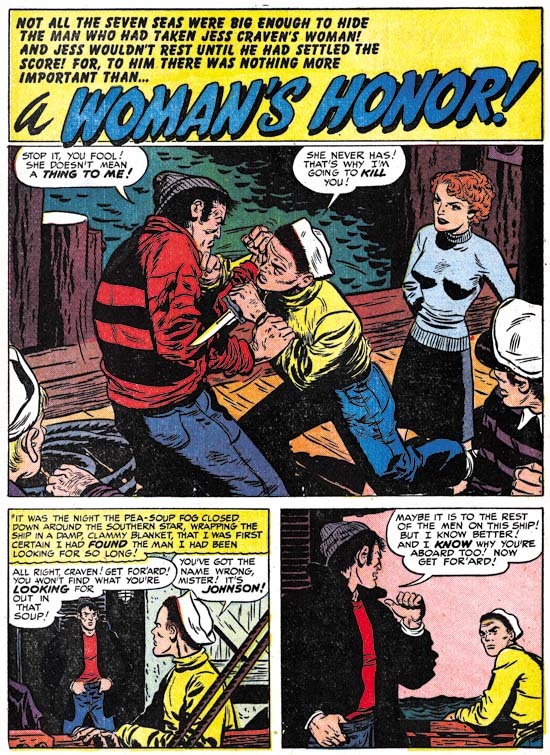 You normally would not see something like the sailor with the white hat in Bill’s love stories at this time. 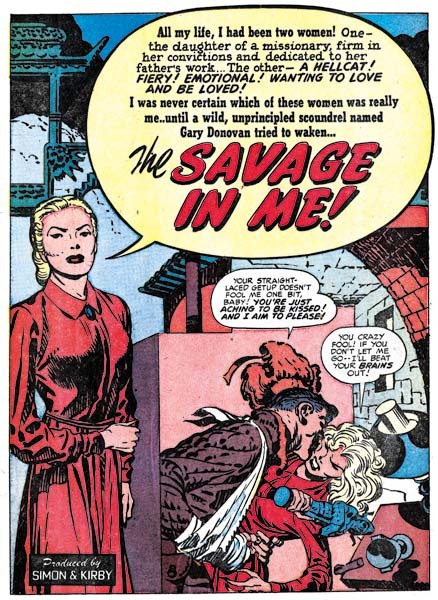 The splash panel is also something not to be seen in a romance work. How seedy can you get? Beat up trash cans, littered bottles and yeah I am sure that man in the background is just asking directions from the woman. Note the building on our right; the way the bricks are roughly inked as solid black is a mannerism often used by Draut. I am not sure why but John Prentice did not seem to do as much work for Black Magic as compared to what he did for the romance titles. It certainly is not because he did a poor job on them; quite the contrary. 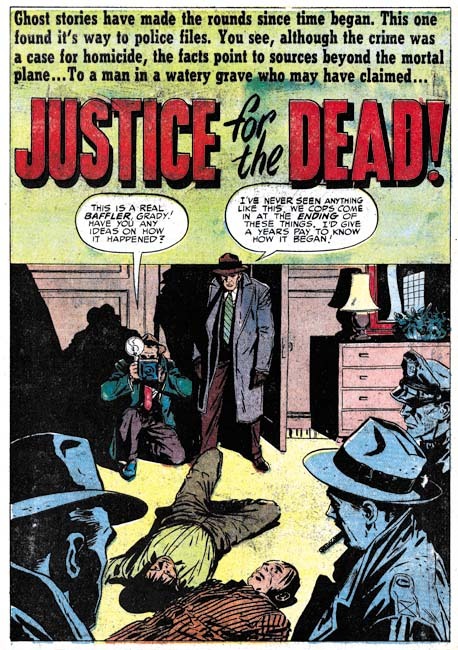 “Justice for the Dead” is a typical Black Magic piece but with a crime slant that shows that John would have made a great crime comic book artist. He had previously worked for Hillman so perhaps he had done some drawing in that genre there. The GCD lists Prentice as also having worked in Gang Busters and Mr. District Attorney for DC but I have not yet verified that. 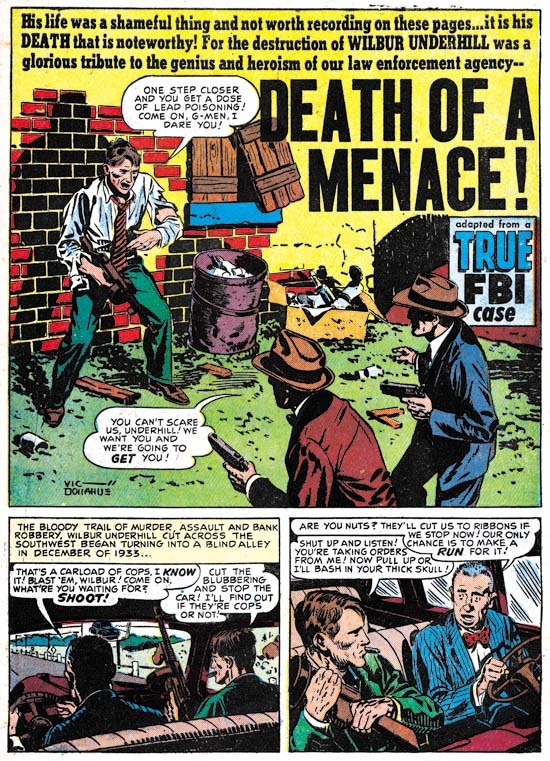 Years later John would do some work for Simon and Kirby’s Police Trap and later yet take over the syndication detective strip Rip Kirby. 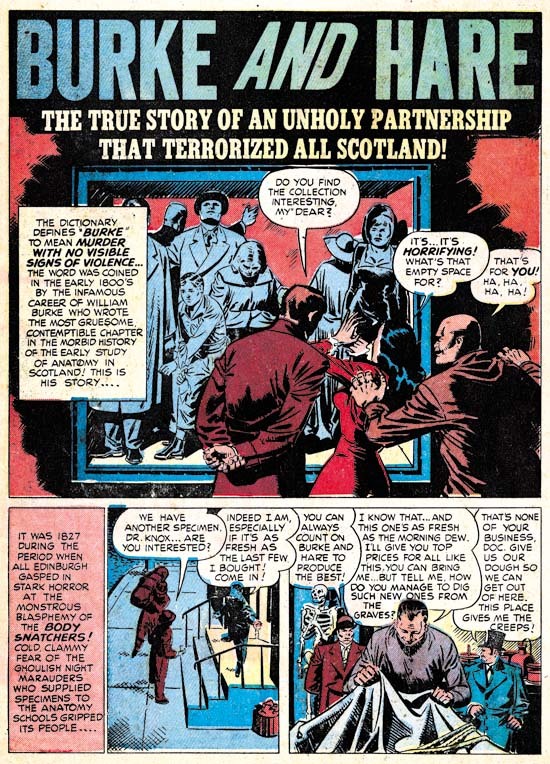 My knowledge of John Prentice work outside of the Simon and Kirby studio is sadly incomplete but I am working on rectifying that defect. 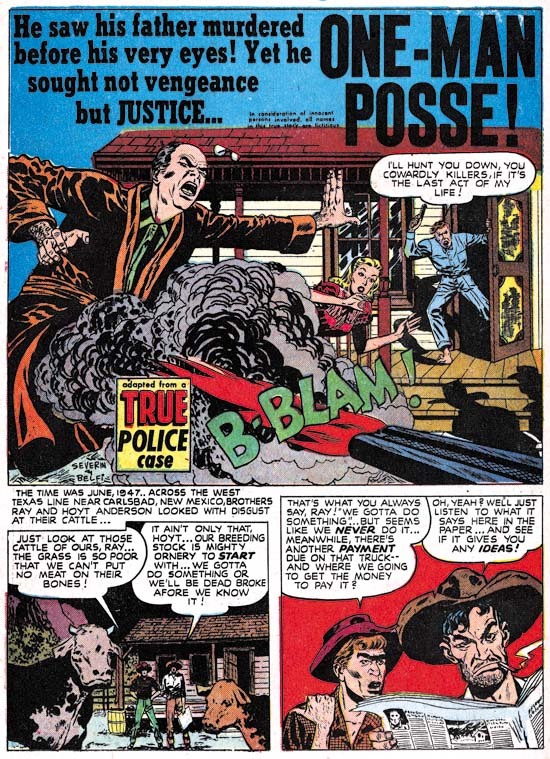 BM #3 (February) marked the earliest appearance of pencils by George Roussos in a Simon and Kirby production. 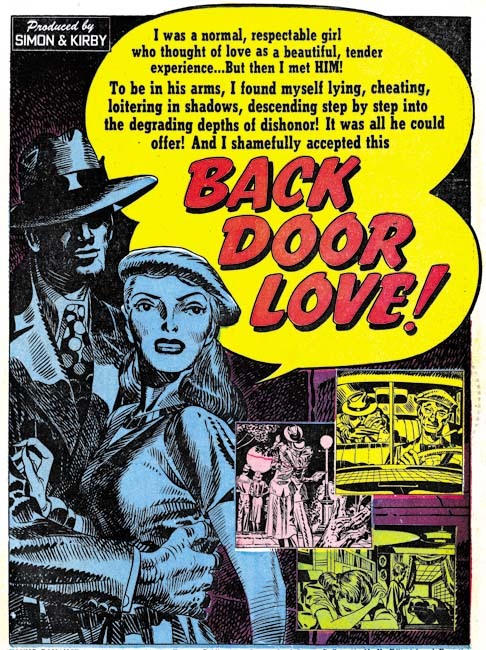 Despite having two stories in that BM #5 and one in the next issue, it is odd that Roussos has not yet appeared in either Young Romance or Young Love. 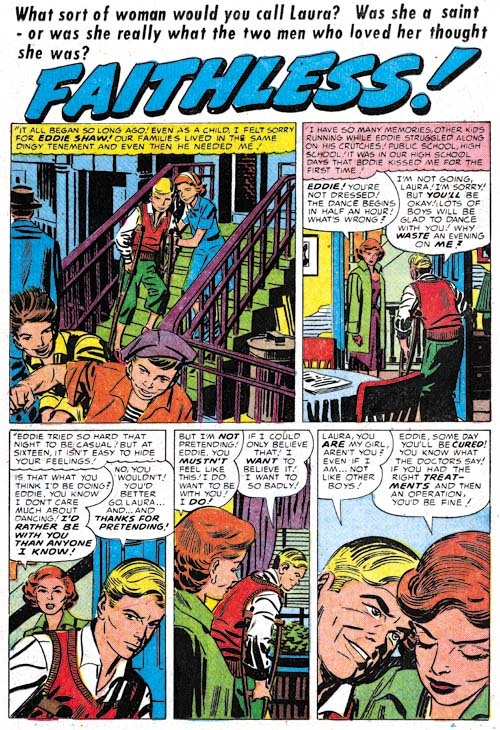 Since George did a lot of inking and was well known to Joe and Jack there is the possibility that he has help with inking Kirby’s work prior to this but I have seen nothing that confirms that conjecture. 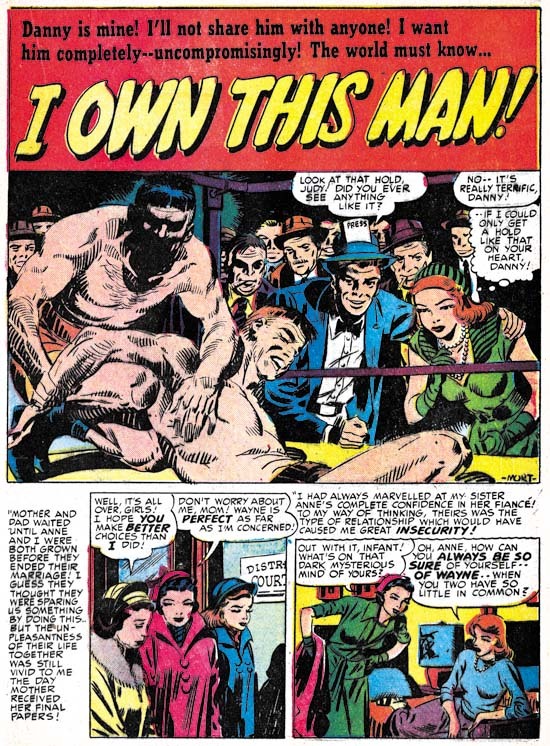 That Simon and Kirby both knew Roussos is indicated by a sketches both did for him in 1942 (Joe did Hitler in a zoot suite (Poking Fun at Hitler) and Jack did the Boy Commands (A Belated Happy Birthday to Jack Kirby). 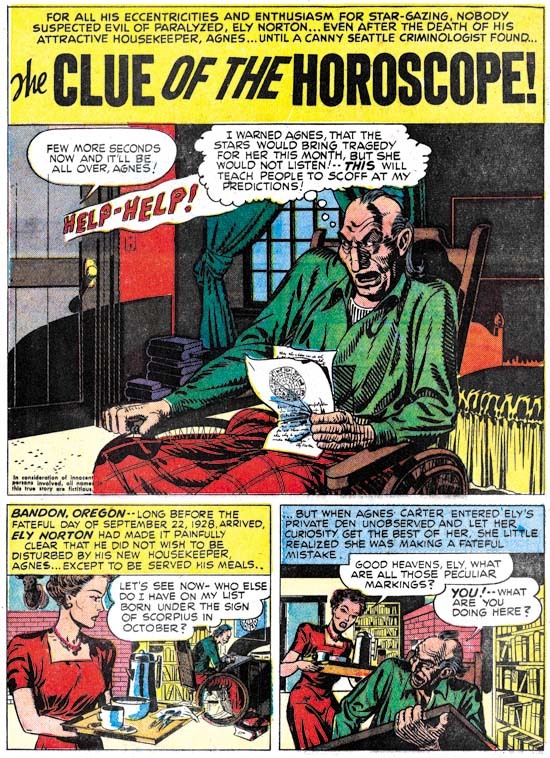 George also knew Mort Meskin and had inked some of Mort’s work for DC (Early Mort Meskin). 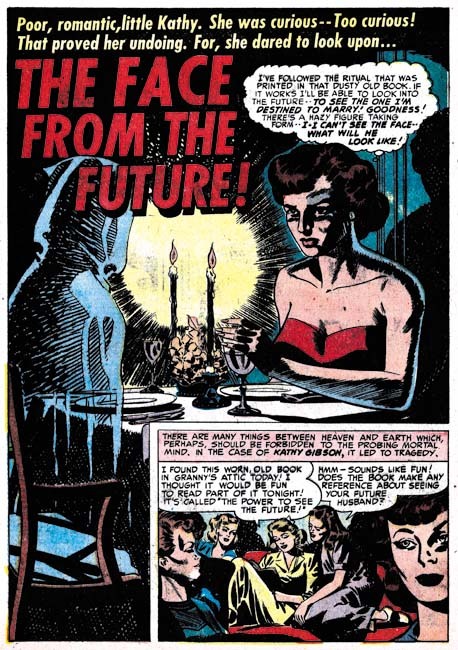 As often happens in Simon and Kirby productions, George Roussos’ splash for “The Face from the Future” uses some inking technique that seemed borrowed from the Studio Style inking. 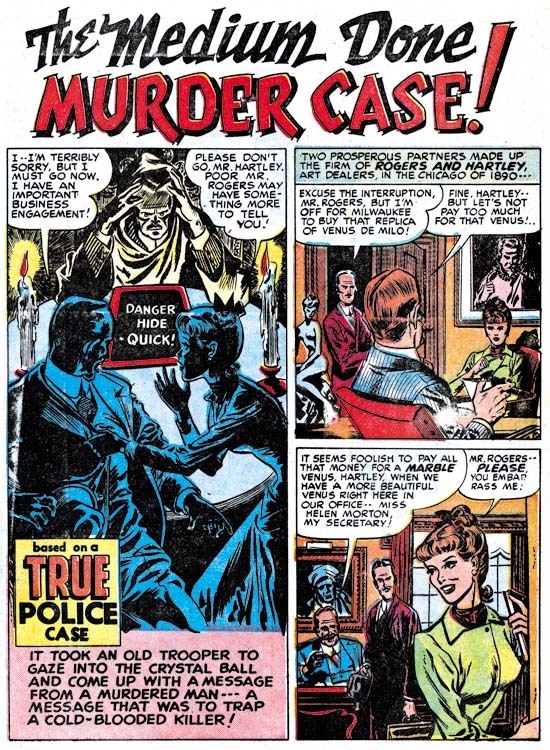 In this case we find picket fence crosshatching (Inking Glossary) on the hooded figure and a rounded shadow in the upper right corner. However it is clearly Roussos doing the inking and not Joe or Jack touching it up. 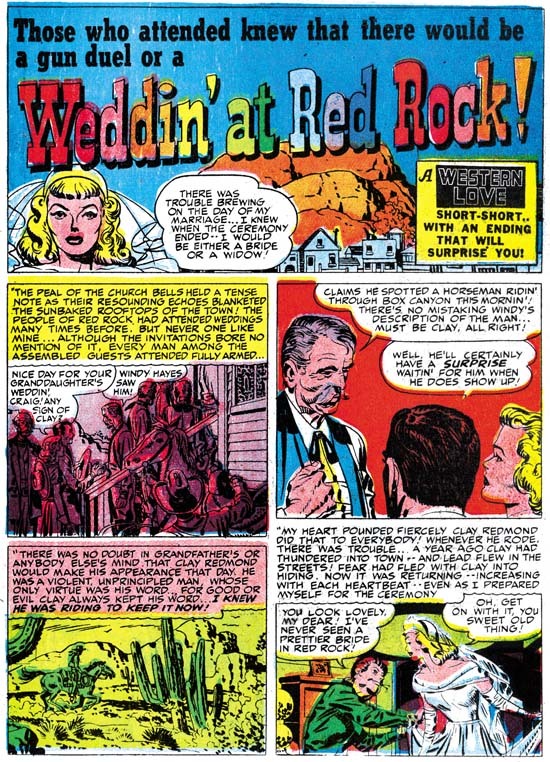 While there is classical picket fence crosshatching on the right ghostly figure it changes as it proceeds to the left and becomes an inking technique not found in the Studio Style. There the shadow is built with short strokes that initially look like the pickets from the picket fence crosshatching but without the rails. The rounded shadow in the upper corner has a ragged edge that again is not typical of the way it usually is done in the Studio Style. George does such a great job on the splash for “The Girl the Earth Ate Up” I could not resist including it. 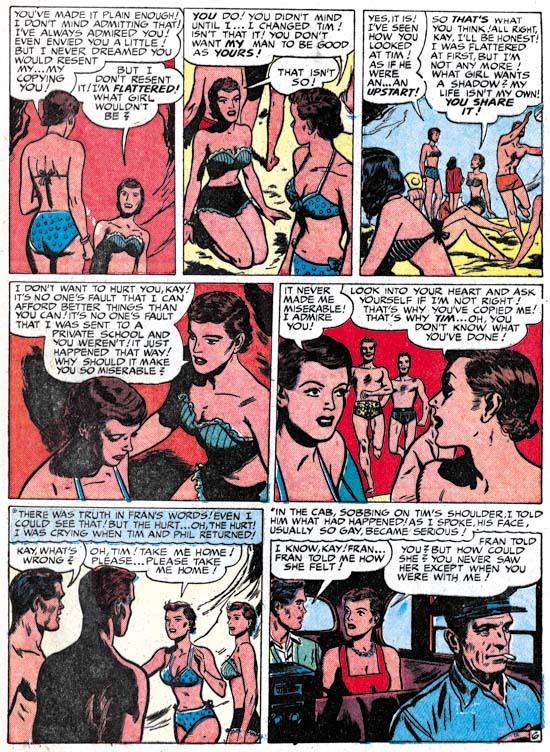 Do not get me wrong Roussos pencils and inking are on the crude side but his use of blacks makes it really work. 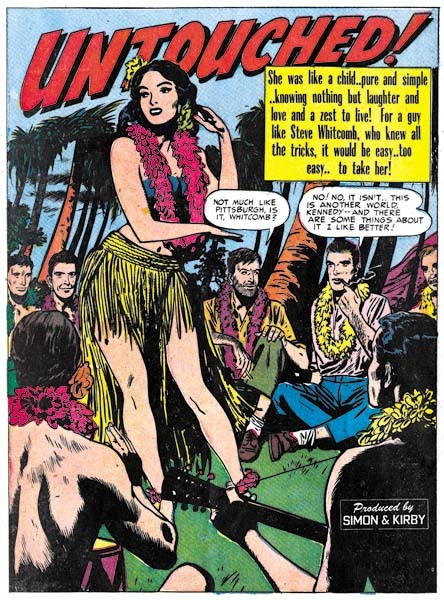 Vic Donahue has not been appearing in Simon and Kirby productions for a while and this is the only work that I have assigned to him for 1951. 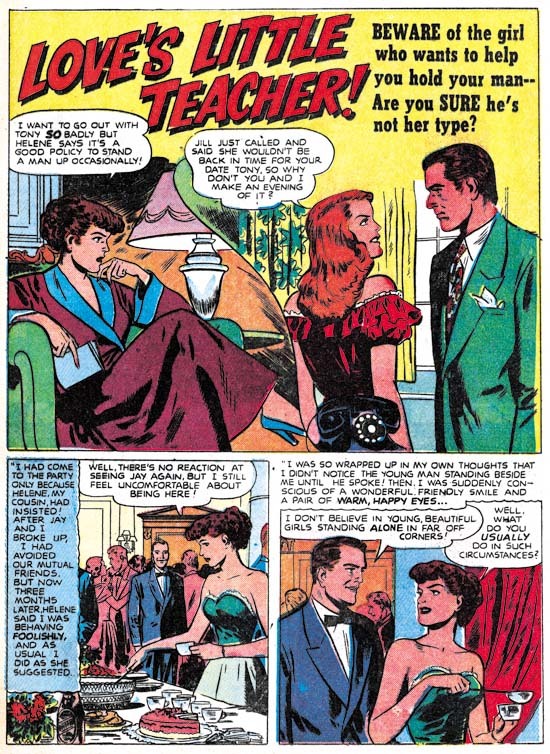 It is an odd story and it allows Vic to draw the type of characters that would not have been appropriate for romance work. 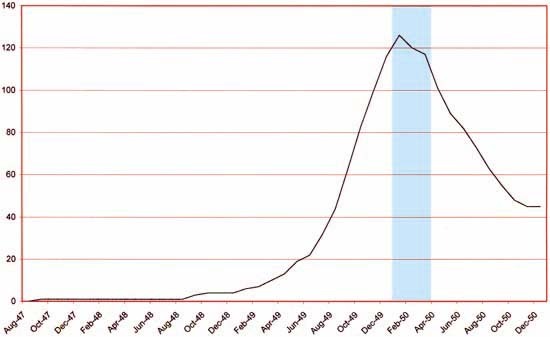 Even so I just cannot get enthusiastic about Donahue’s effort. 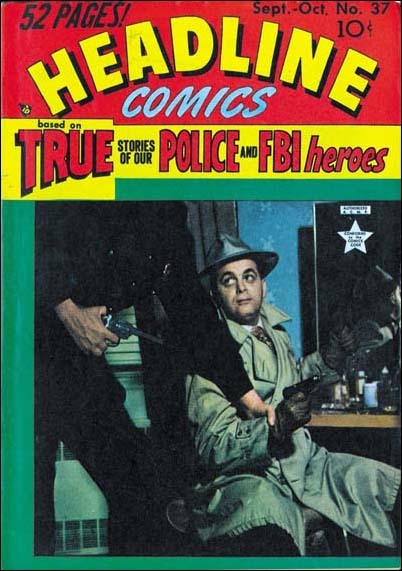 Vic was one of the lesser talents in the Simon and Kirby studio and now that all three of the usual suspects (Bill Draut, Mort Meskin and John Prentice) are present Donahue will rarely appear again if at all (my database has no more entries for him after this one). There is one Black Magic artist from this period that I have not been able to identify but he does a nice job on “Follow Me”. Good characterization, excellent inking and good graphic story telling.